Traveling is a very personal matter! Following masses and ticking checklists has never been my cup of tea! As founder & director of travel12, I see every client as a unique personality who is looking for a fulfilling and enjoyable experience, in their own very personal way. I strive to design and deliver coherent and authentic experiences, tailored to the needs and preferences of the traveler. Remember, travelers are like days. No two are the same! "I am passionate about sharing true, meaningful experiences with people from all over the world. Traveling is all about living like a local, acting like a local, seeing things through the eyes of the locals. 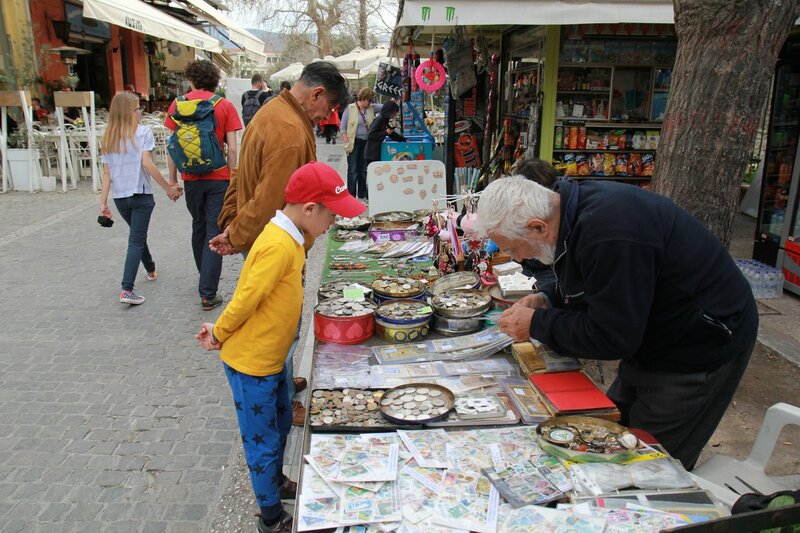 History, culture, tradition, art, natural elements, food & wine production, gastronomy, cities & villages: experiencing different aspects of the locals' everyday life is what brings people closer, what makes understanding possible and what helps create unique and memorable traveling experiences. I have traveled across Greece by car, boat, train and plane. I am still missing a few corners that I am looking forward to discover! " I have been looking for ways to experience the destinations I visited in an authentic way, to 'become a local' for a few days, to live the destination rather than just visit! 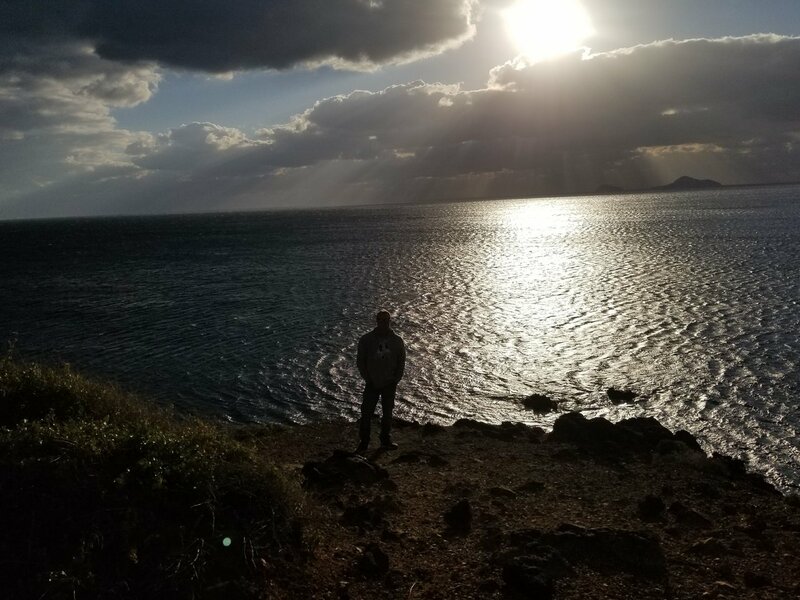 Finally, I decided to leave behind my career in consulting and banking to embark in a new journey: offering unique experience in Greece to travelers from all over the world. The joy in their faces is my best reward!" When my wife and I took the plane for Cuba, we could not imagine that on the last of our trip, while walking on the 'Malecon', we would feel so much at home! 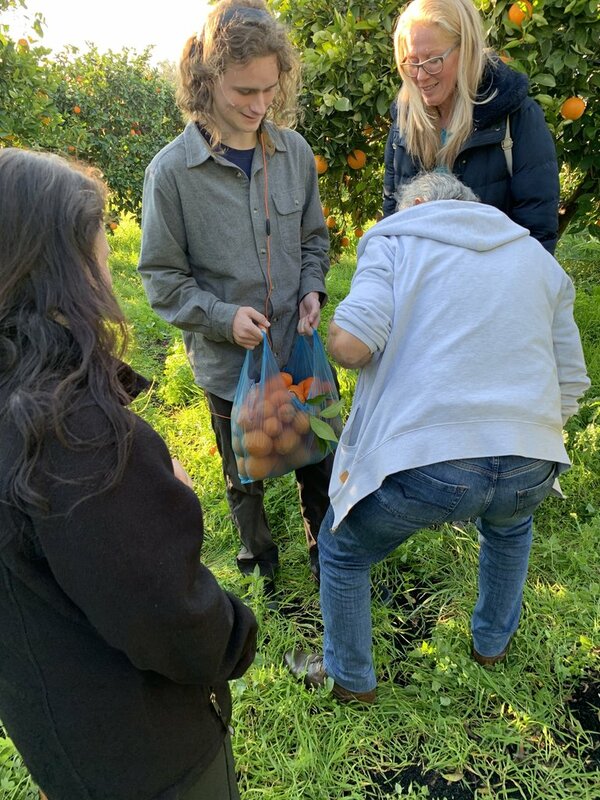 It 's all about meeting local people, wandering around, learning about their culture, picking fruit from the trees, tasting local recipes, participating at local events! 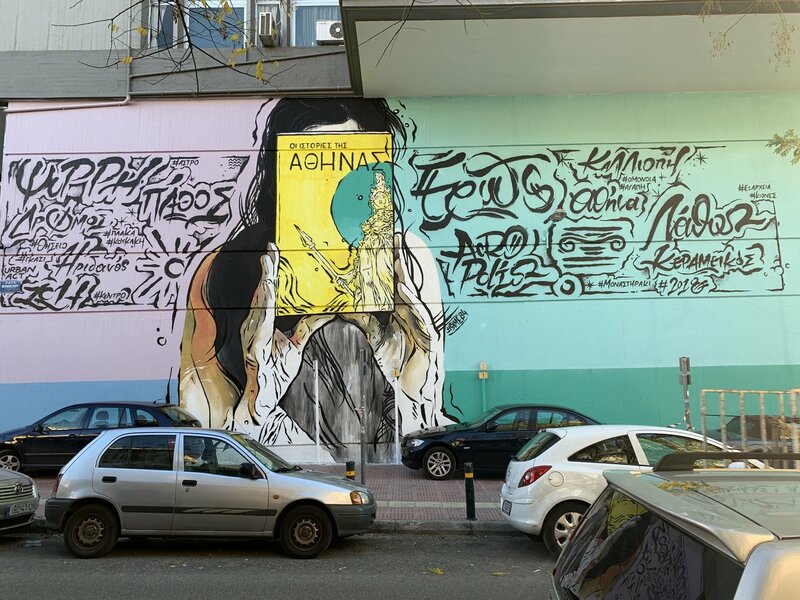 I still remember that day in Trinidad, inside a merchant's house, when we talked for hours like old friends..."
Ancient cultures and modern day life meet on this five-day exploration of Greece's capital city. 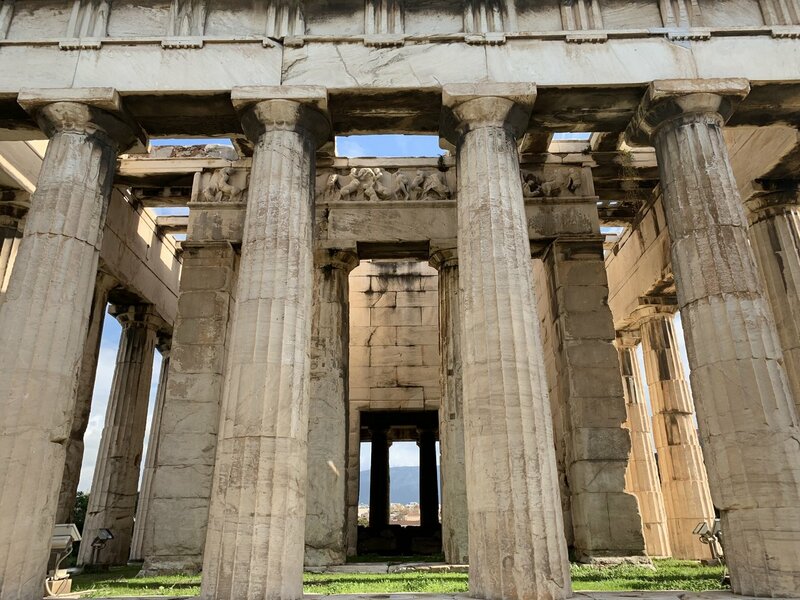 Immerse yourself in the history of the Golden Age with a visit to the Acropolis and the Parthenon. 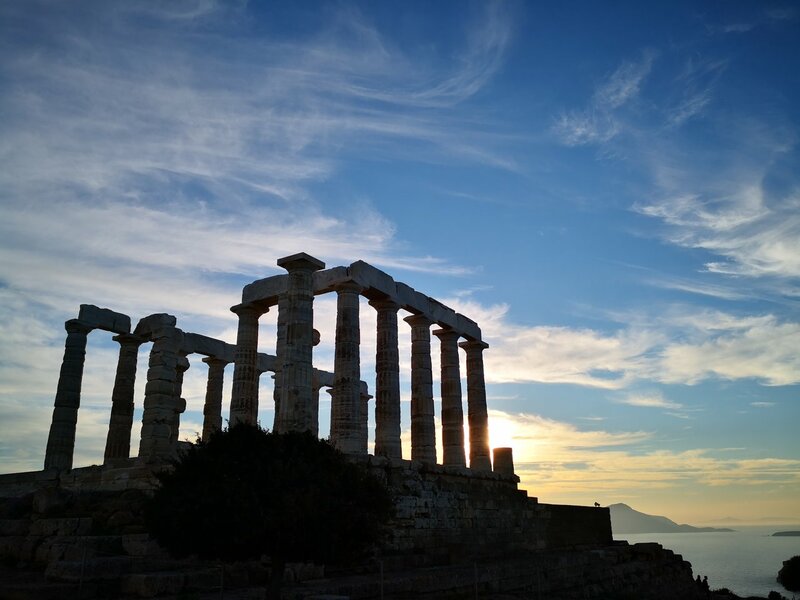 Stroll the historic cobblestone streets of Athens' many neighborhoods, learn about the ancient rites of the Eleusinian Mysteries, and relax by the sea on the Athens Riviera. 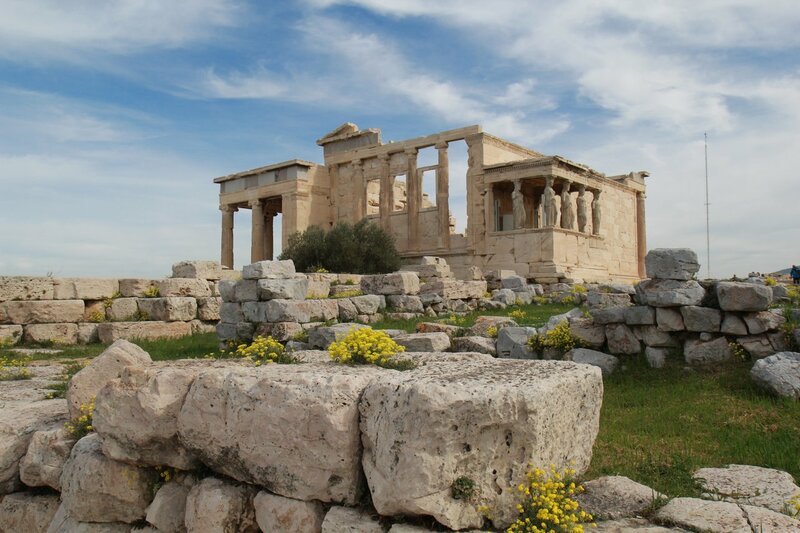 Dive headfirst into history with this tour of some of ancient Greece's most important sites. Go from Athens and the Acropolis to the oracle at Delphi to the islands of Delos, Santorini, and Crete. 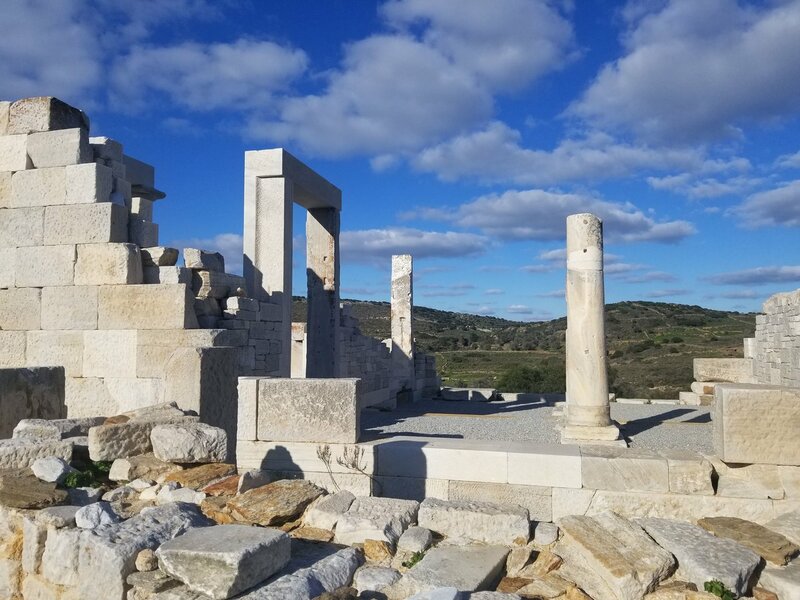 Along the way, you'll see fascinating archaeological ruins and visit some of Greece's most beautiful locales. 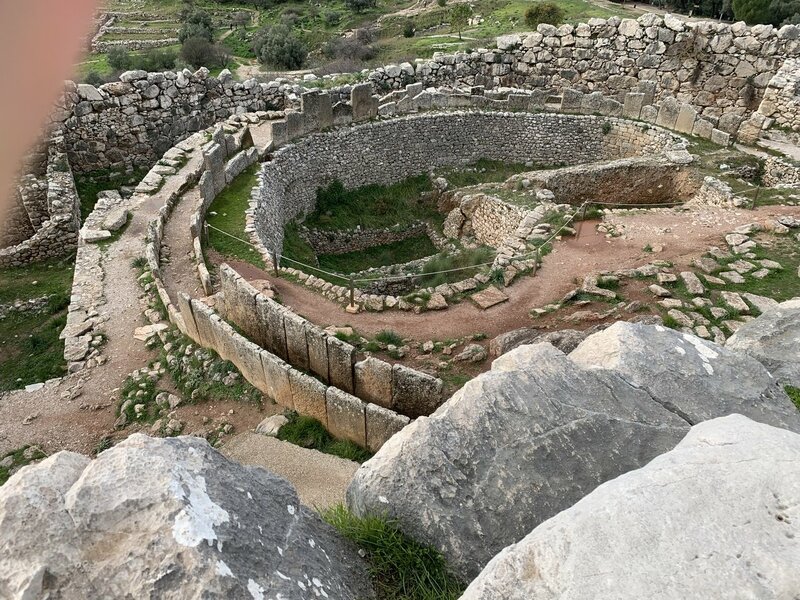 Wrap up your trip back on the mainland with a stop at Helen of Troy's home at Mycenae before returning to the modern era. 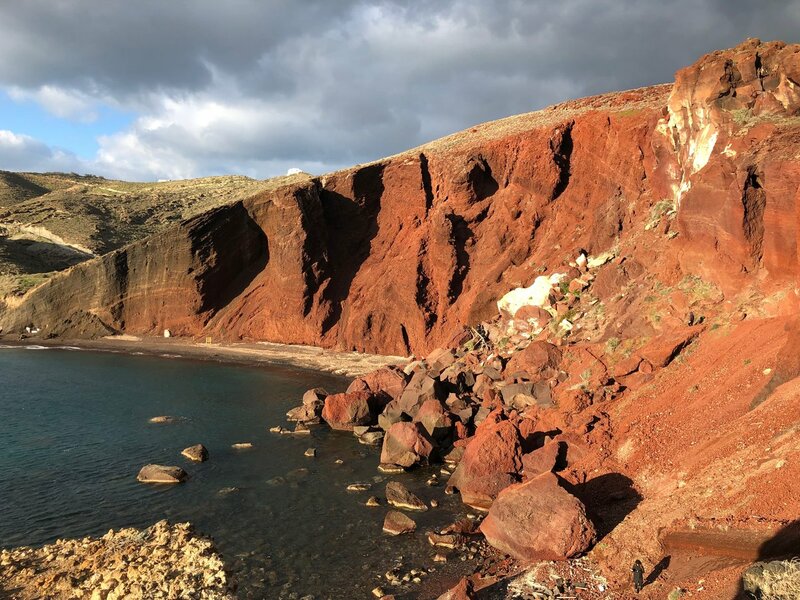 These four Cycladic islands haven't graced as many guidebook covers as their glitzier cousins, but that just means there's more here for you to discover without battling hordes of selfie sticks. 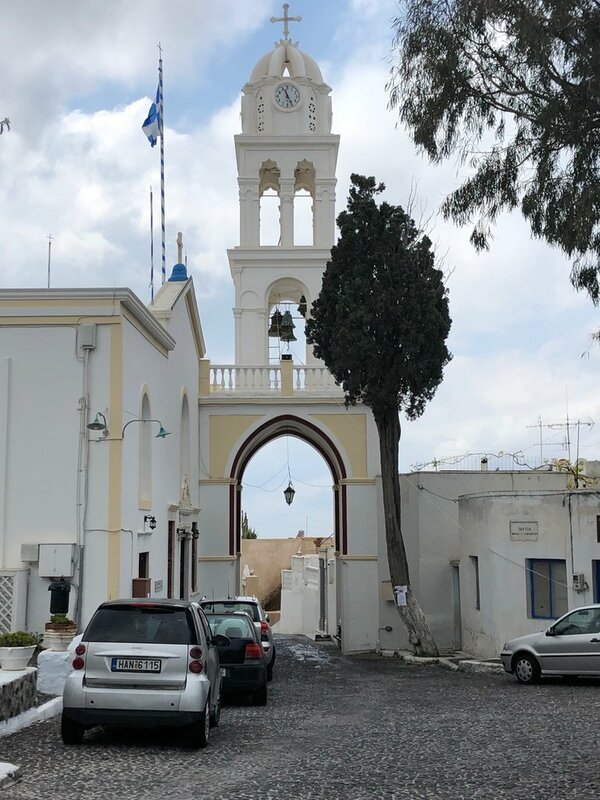 Take 10 days to tour Syros, Tinos, Naxos, and Ios on this itinerary, with pilgrimage sites, culinary experiences, and more. 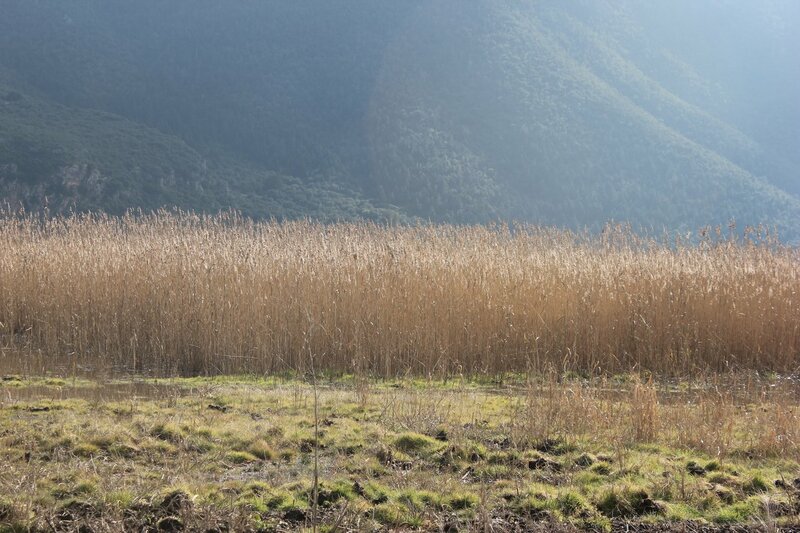 Take a week to drive through the mythological territory of mainland Greece with this itinerary. 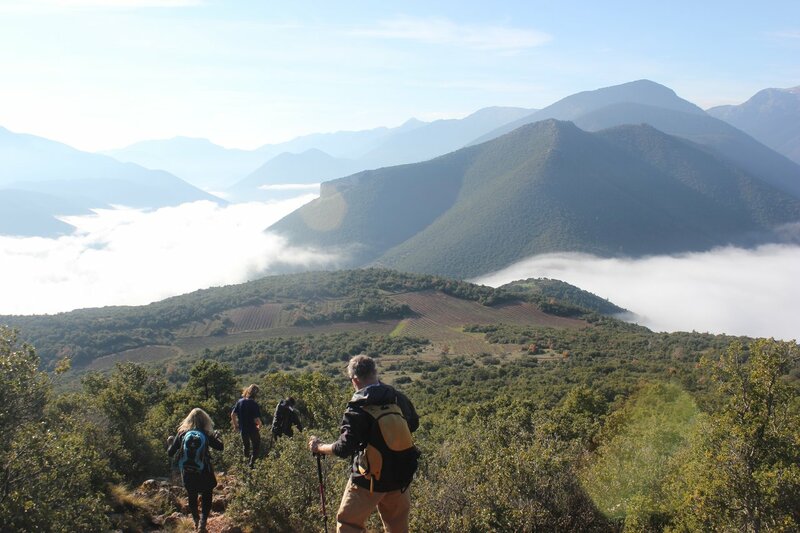 Your seven days will start and end in Athens, covering the historical sites and sprawling castles of the Peloponnese along the way. Escape the troubles of the world with eight days in the Cyclades. 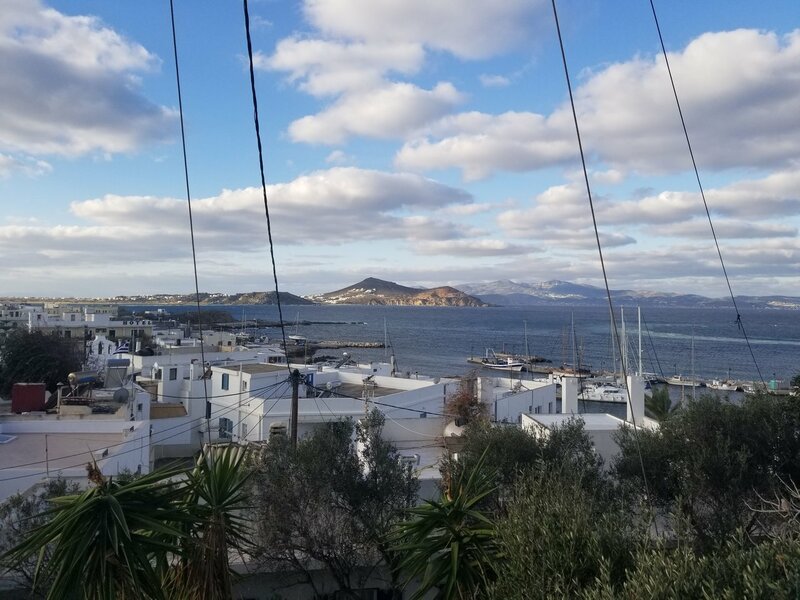 You'll arrive in Athens, then head to the islands to explore famous Mykonos and Santorini as well as lesser-known but spectacular Naxos. Enjoy your Greek vacation filled with sun, sailing, and sampling, with cooking classes and traditional dinners accompanying your days of blissful idleness. 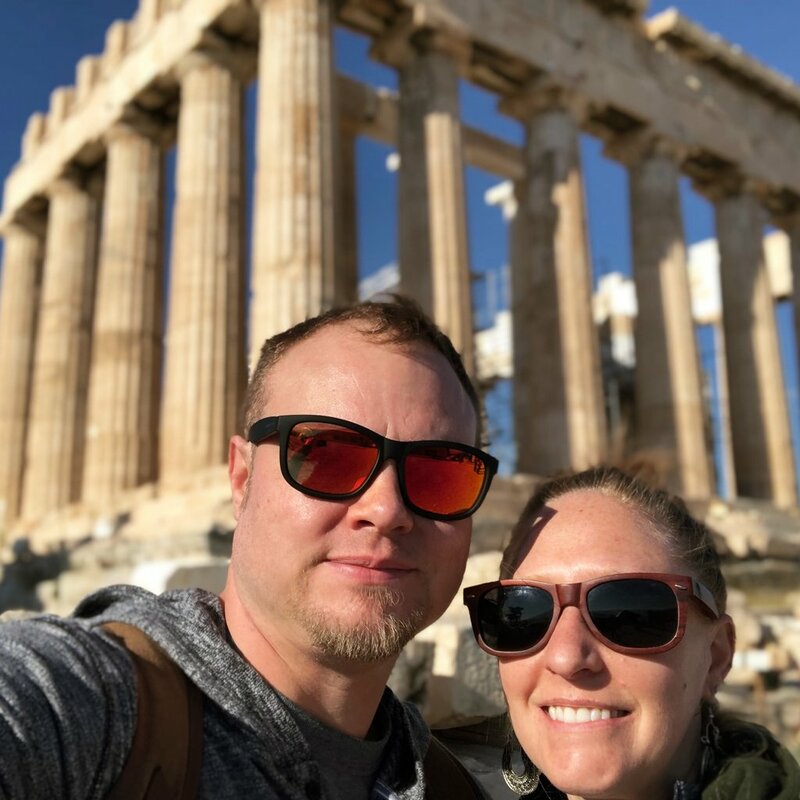 We had an incredible time in Greece. 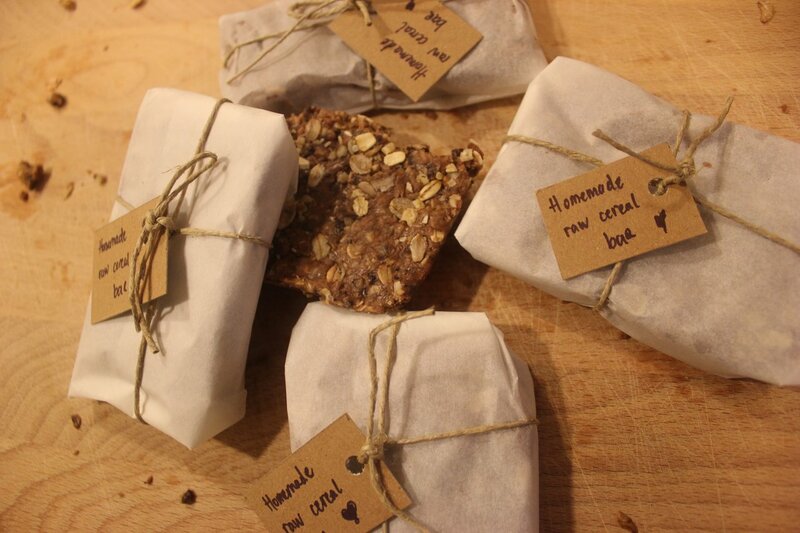 We wanted an authentic experience of the history, the food and the people and we received that and more. Tasos looked after every detail of our vacation, made excellent suggestions and guided us through the process even as we changed dates. All of the tours were perfect. Small, personalized and entertaining. The people were amazing from our guides to airport transfers to hotel managers everyone made us feel at home and well taken care of. I highly recommend Travel 12 and their team! It was a real pleasure having you as guests. Our team is honored by your genuine interest in Greek history, culture and everyday life. I am very glad you enjoyed this trip and I will be delighted to help you plan your next visit whenever the time is right. Kim Kim was very easy to work with and Tasos team was excellent. 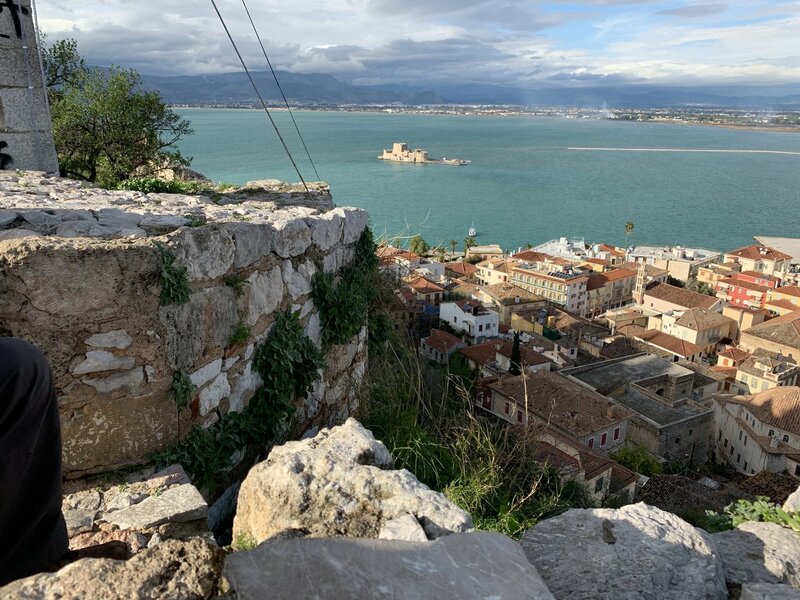 Although we were surprised that admission tickets were not included for our visit to fortifications in Nafplio. Lampros excelled at serving us. Our guide Hercules was like old friend treating us to a tour of his hometown. Olive farm and sheep farm visits will always be great memories. It was my great pleasure helping you organize your trip to Greece and I am very glad you enjoyed it! It feels great to know that as a team we contributed to your beautiful memories of our homeland, and it will be our pleasure to welcome you again and show you more of the hidden gems it has to offer. Four of us have just returned from a most memorable trip to Greece. We chose to work with Tasos and were not disappointed. He worked with us to develop and integrate all the sites, hotels and details that we wanted included. He did it all perfectly and then some. 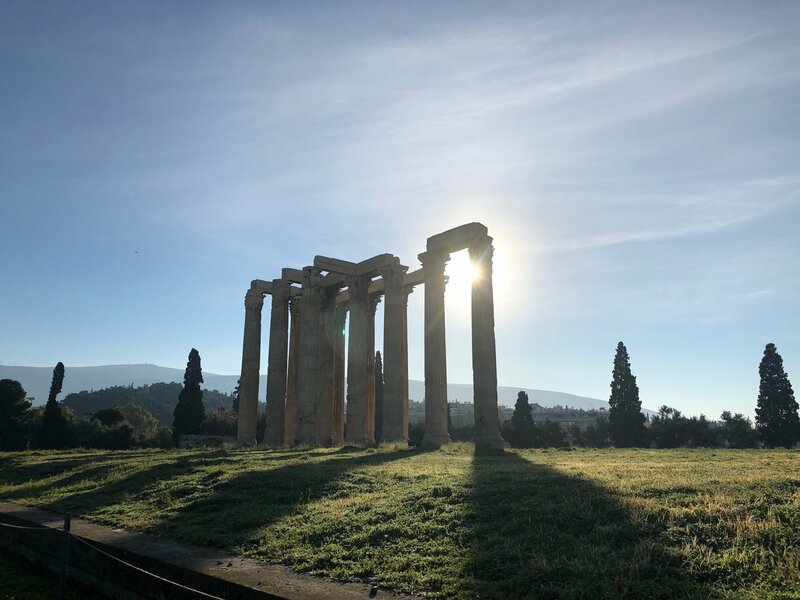 We started with four days in Athens from where we visited several locations in Southern Greece, including Corinth, Mycenae and Napflion. Three nights in Thessaloniki gave us great coverage of Northern Greece-Kavala, Philippi and Meteora were all spectacular. Next we chose to see the island of Rhodes for its history and amazing medieval castle. We asked Tasos for his pick for a second island. He suggested Siros and it could not have been better. In summary, we had 14 wonderful days in Greece and at quite a reasonable price. I highly recommend KimKim and Tasos. 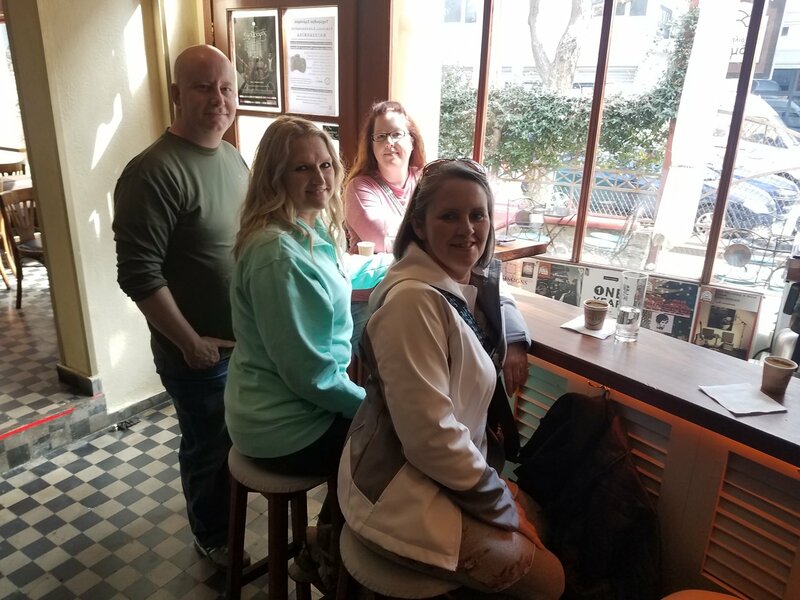 It was a real pleasure meeting all four of you in Athens, and I am very glad you enjoyed your trip and you have returned home with such memories. 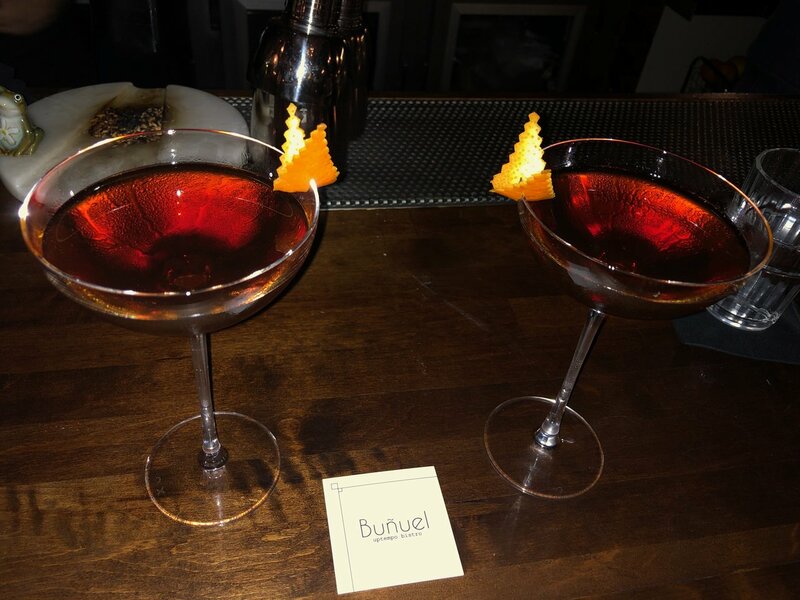 It has been great working with you and I look forward to helping you plan your next visit! We, a family of four (two adults and two kids, one boy 8 yrs and one girl 11 yrs) had one full week of dream vacation in Greece , thanks to Tasos and his team’s dedicated arrangement! Yes, This is a dream trip that we print out those photos and frame, rather than just post them on social media; a dream trip that turns us into artists, spending hours to record those moments by drawing; a dream trip that could serve as fodder for party conversations for year from now on……..For this, we would like to give a big shout out to Tasos and his team, for helping us develop the most suitable itinerary for our family; for booking most amazing accommodations at each destination; for offering best options/services on means of transportations; for providing 24/7 real-time support and overseeing all details to ensure the perfectness at each stage of the trip. 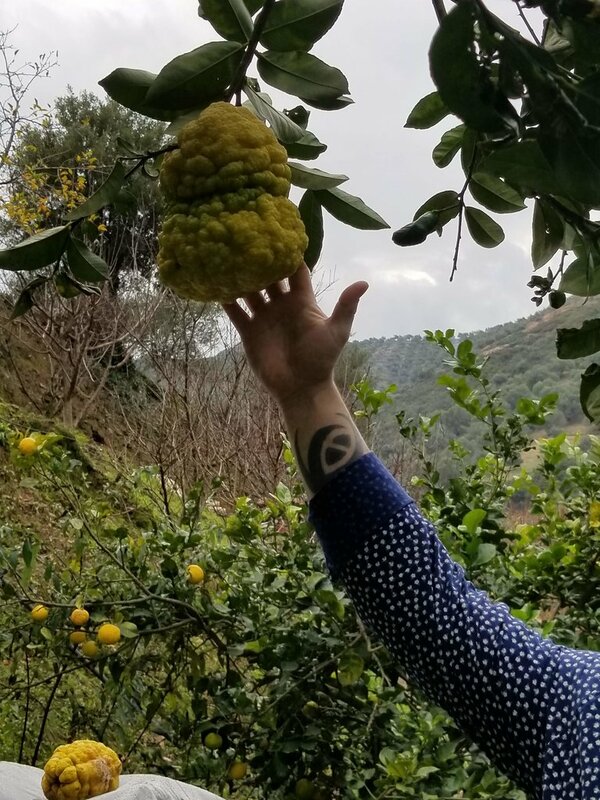 The trip itinerary that Tasos put together for us embraces two types of experiences: immersing ourselves into the world of Greek Mythology and ancient history; living like a local through mountain hiking and farm visiting. 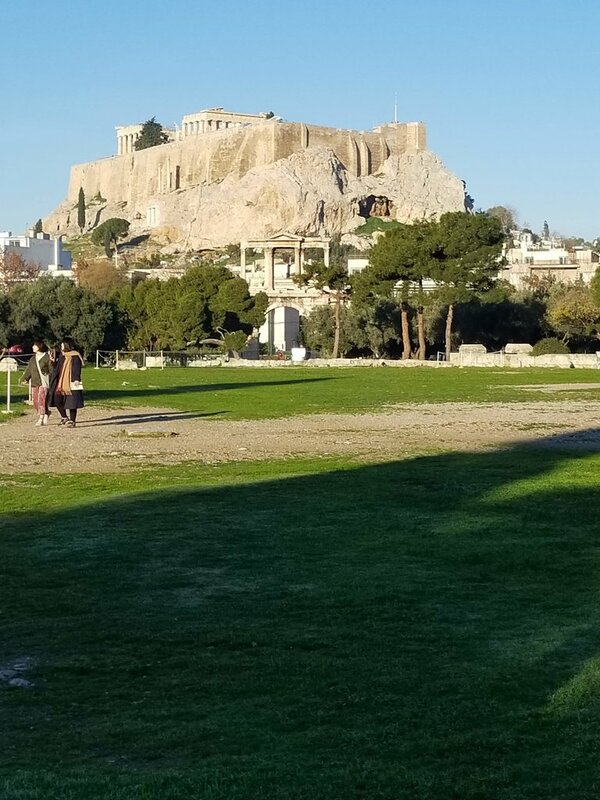 We had spent two days in Athens, visited Sounio (a breathtaking scenery of the Temple of Poseidon at sunset), Temple of Zeus as well as Acropolis through a Mythology tour, Plaka (eating and shopping), Roman Agora (seeing the Tower of the Winds), the Parliament Hill (watching the Changing of the Guard ceremony). Then we drove to Kalabaka, where we had a marvelous mountain hiking with our fantastic tour guide Kris from Meteora Thrones; he took us into the routes where ordinary tourists may not be aware of (thus we could see unique views); we also visited four of the six UNSECO monasteries. 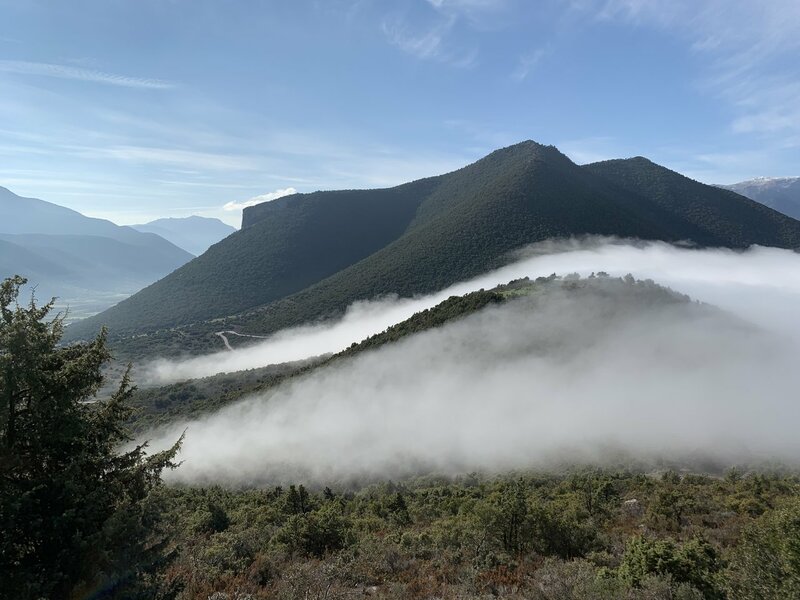 The next day we drove south to Delphi Archaeological site (another UNSECO heritage site), where the ancient Greeks considered as the central of the world. 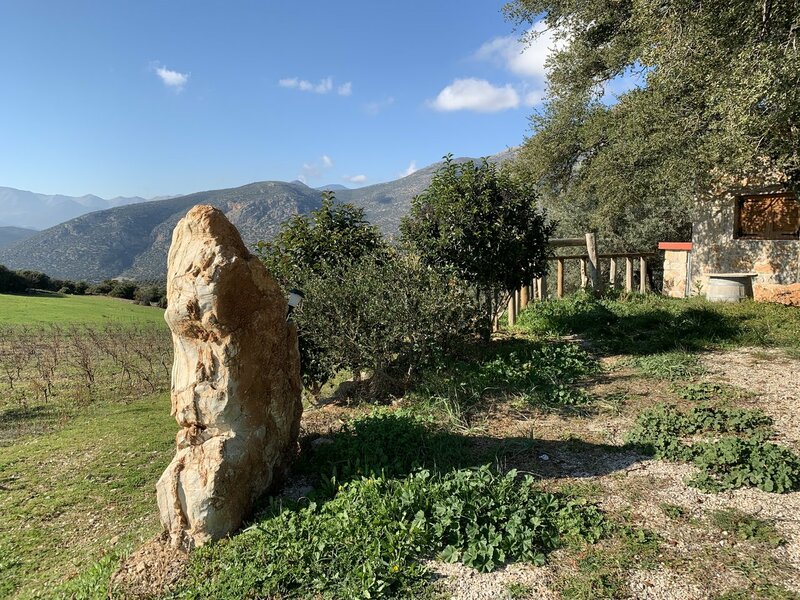 Through a private guided tour, we soon understood how those ancient ruins were originally constructed following a holy-path as the Sanctuary of Apollo and the significance of the site of the ancient Oracle in Greece. 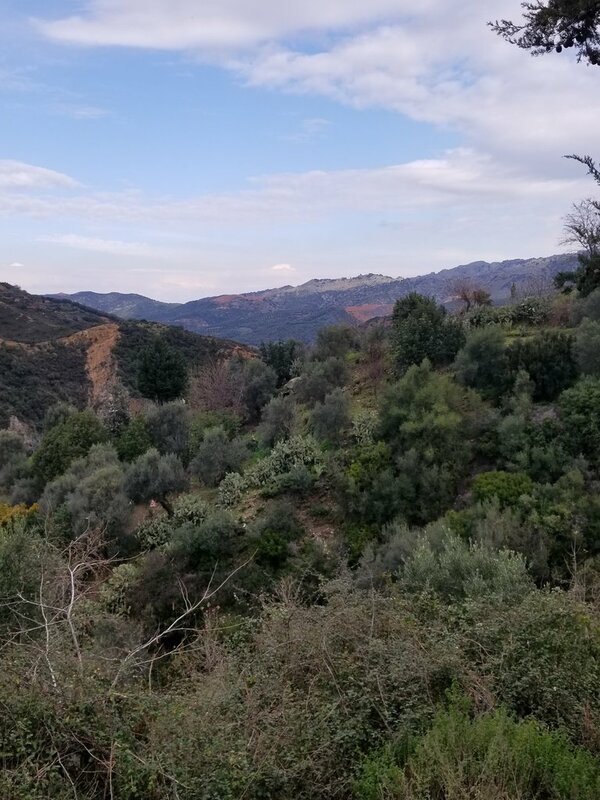 On the sixth day of this trip, we drove towards the Peloponnese through the impressive suspension bridge of Rio, visited another two UNSECO sites. 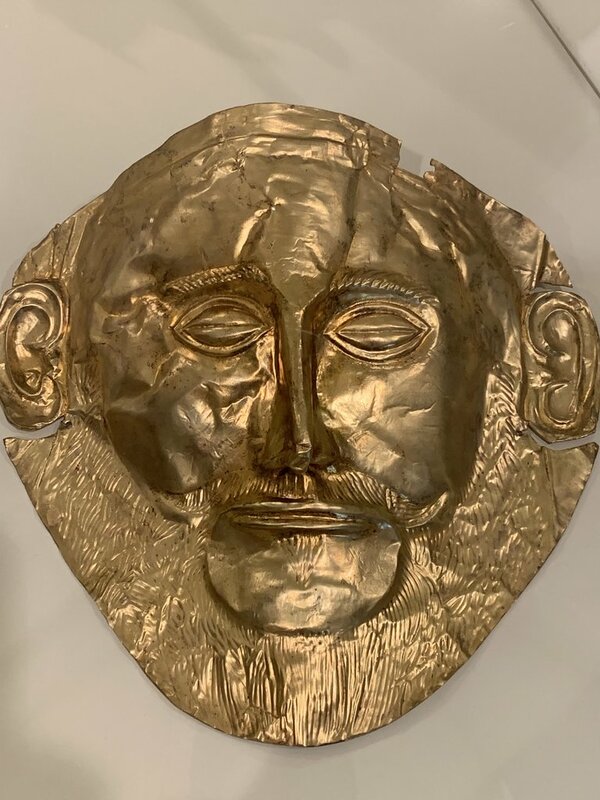 It was a spring windy day, we thought we saw the best part of the “rich in gold” Mycenaean civilization centre at the Mycenae archaeological sites through the signature Lion Gate and the beautiful “Mask of Agamemnon” (although it is a replica and the real one in National Archeological Museum ); we were also lucky enough to perform in the Ancient Theatre of Epidaurus, where we enjoyed the astonishing acoustics designed by ancient Greeks 2,400 years ago. Then the next day we had an amazing full day with Stavroula's Grecopaths team. We went to an ancient theater performing mimes and dramas with local elementary students; We visited a local farm, getting to know Greek wine, olive trees, orange trees, lemon trees as well as many types of herbs; We had a delicious lunch and pleasant afternoon tea with the farm owner’s family; we also visited a small Greek pyramid (a hidden gem of Nafplio, many visitors may not know of) in the afternoon. 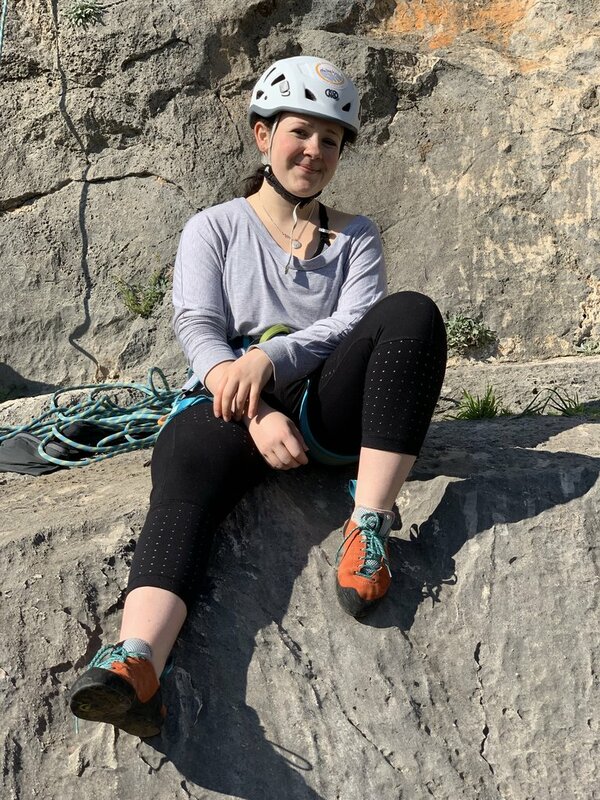 With the excellent guide of Stavroula’s team, we were experiencing the real Greeks for one full day, which became the highlight of our one-week Greece trip. The hotels and B&B Tasos booked for us at four destinations are amazing. 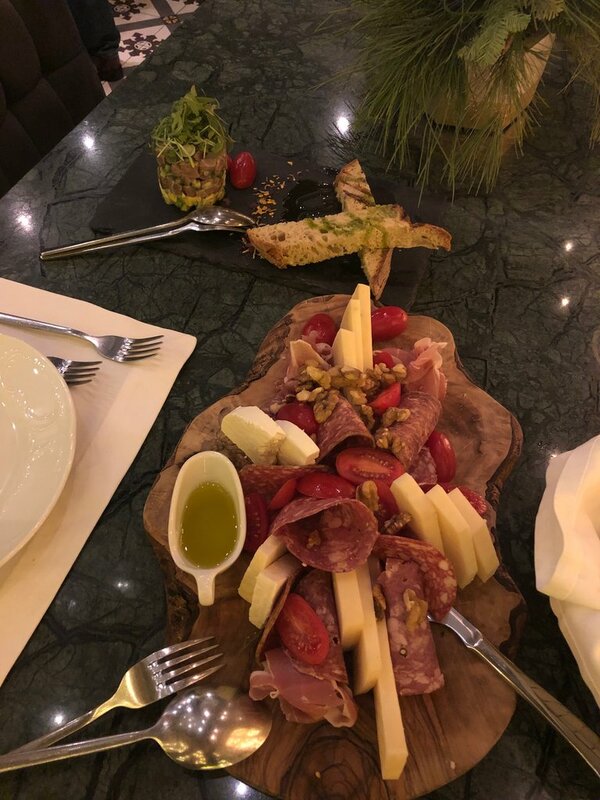 The NLH Fix at Athens has the best location you could have (close to everything); the room is spacious and service is fantastica. The Five-stared Grande Meteora Hotel has one of the best locations in the town, we could see the soaring monoliths from our rooms’ balconies and its sublime beauty cannot be conveyed in words or pictures. The Ippoliti Hotel in Nafpolio, sets in a lovely old pink mansion and is located close to the port, restaurants and cafes. 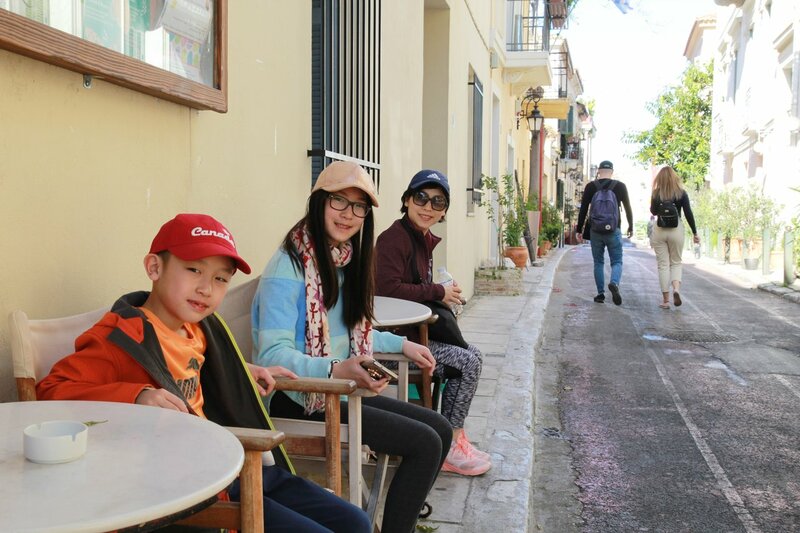 But our favorite is the Ganimede Hotel in Galaxidi, where we stayed in a family suite with two beds in the upper level and one main beds in the lower level. It locates at a very quiet street and nicely decorated. It offered us a wonderful night resting and “the best breakfast in the world”. We really hope we could be able to stay there longer. 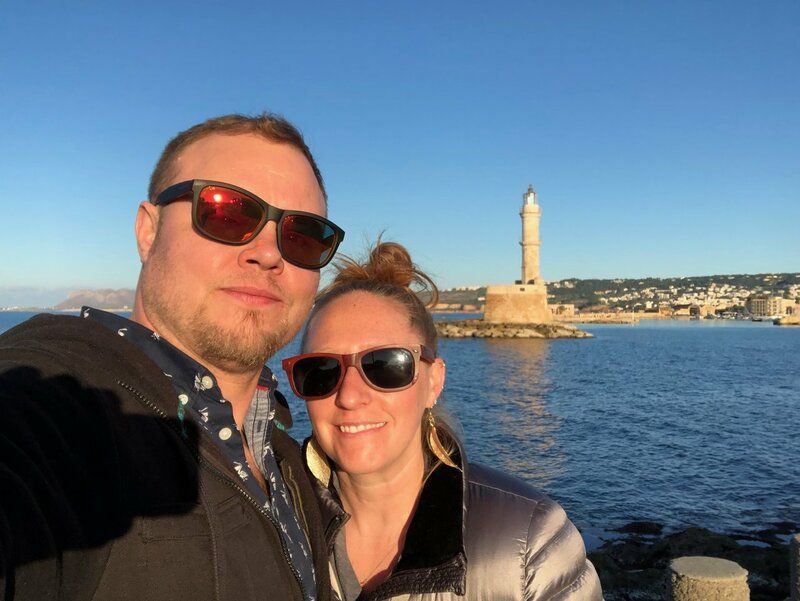 Tasos and his team offered us a local cell phone for communication – all destinations are uploaded into google map and linked to the itinerary; which saved us time and efforts so we could focus on experiencing everything in Greece. During the trip, we could reach him and his team any time by all types of means. 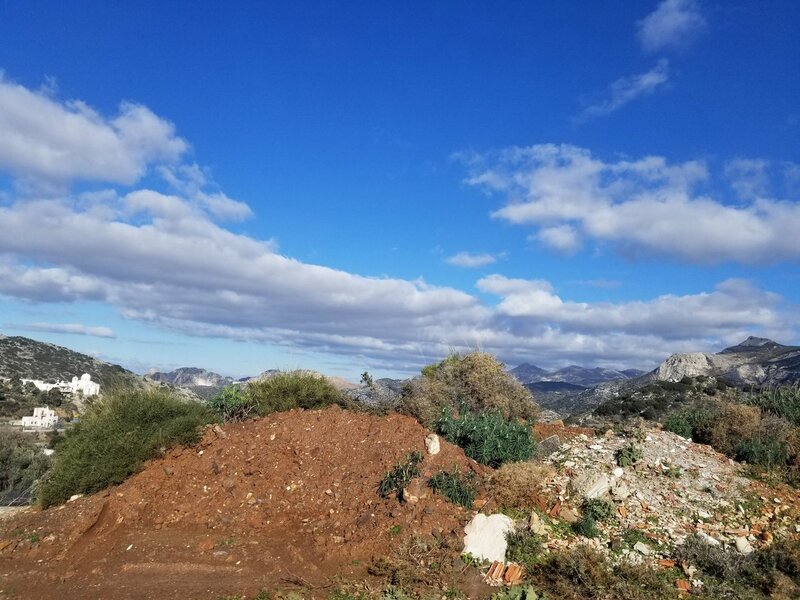 For example, we had an emergency on the way from Nafplio to Athens as we would like to see the Corinth Canal but not sure where we could get the best view. So we called Tasos to let him know our problem. Within less than one minute, he sent us the google map location of Corinth Canal and told us which bridge has the pedestrian cross (so its easier to take pictures). In the same time, Maria from Tasos’ team also reached us regularly to check if everything is on track. 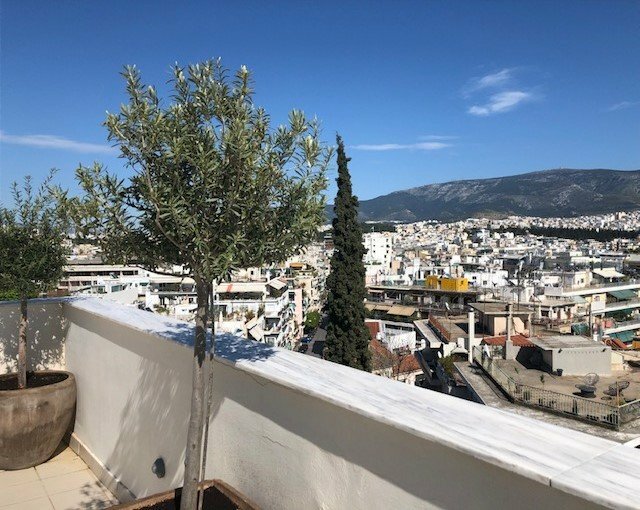 When we asked her to recommend some restaurants along the Plaka while we were wondering there, she sent a list of restaurants within five minutes, each of them are highly rated and great choice for travelers. On the day we were going to leave Athens, Maria also called to check if we need the change the vehicle pick-up place from downtown Athens to the airport as Lampros told her that we were a little bit nervous about driving in the crowded downtown Athens. Although we did not take that offer in order to save time, we appreciate their attentiveness and considerations. All those services helped us create the peace of mind thus we could enjoy every moment while at Greece. 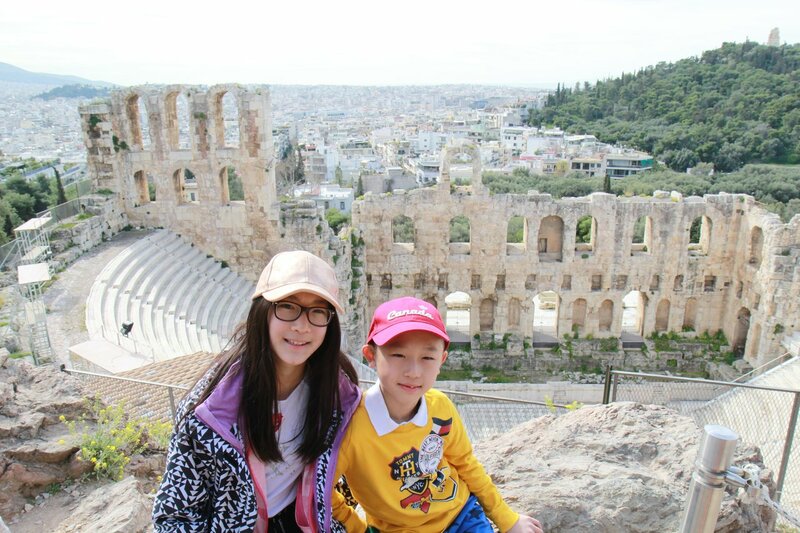 By the end, as my kids said, this is an amazing trip which makes them want to visit Greece again and again! 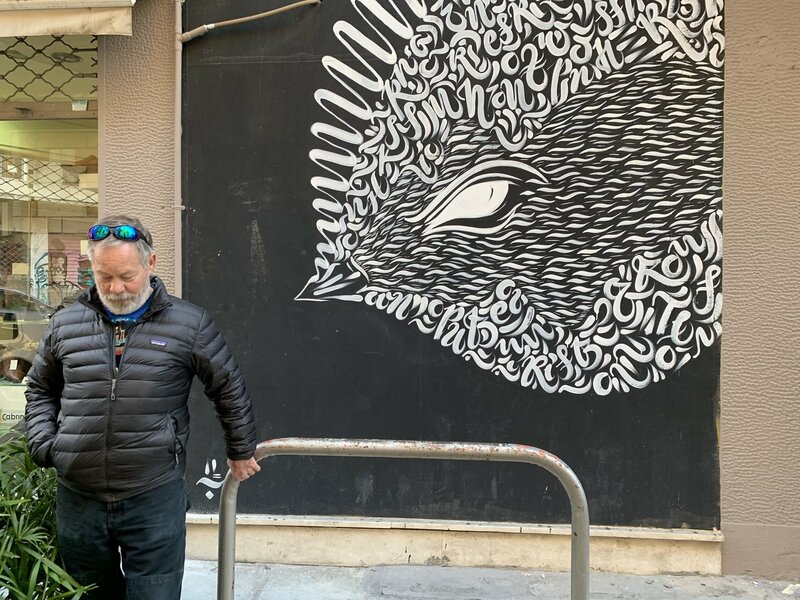 It was lovely meeting you and your family - even briefly - in Athens and I am very glad you enjoyed your trip. There is no better reward for my job than the 'Thank you card' I received from you! 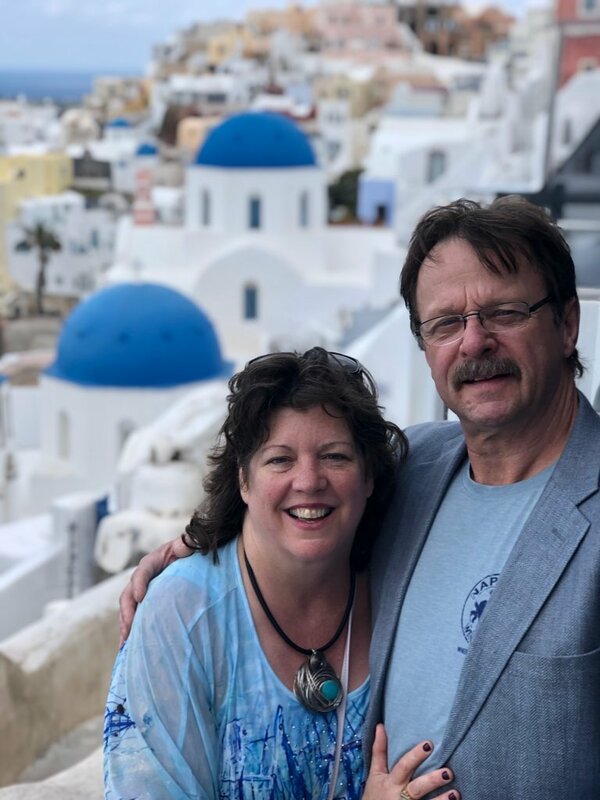 I am looking forward to helping you organize your next visit to Greece to enjoy more of the wonderful nature, amazing sites and authentic Greek hospitality. 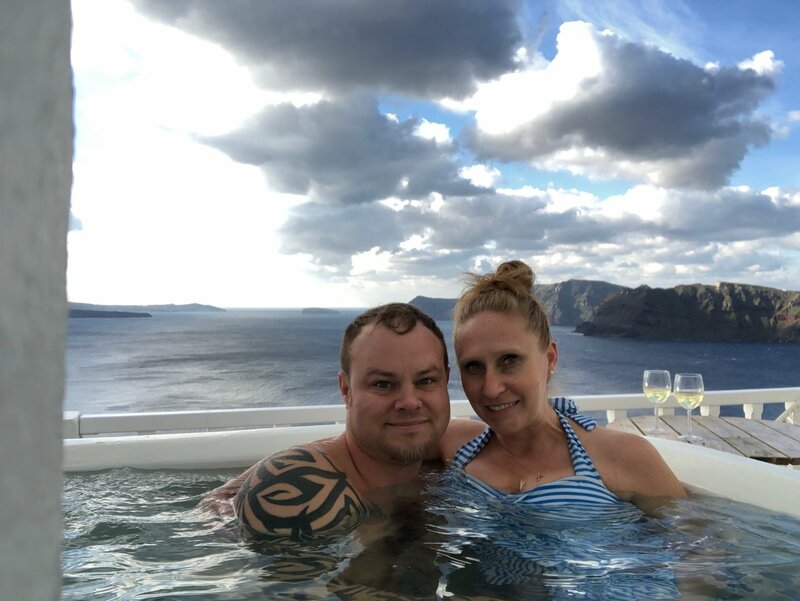 We had an amazing trip traveling to Athens and Santorini. Each hotel we stayed at was very accommodating and the staff was wonderful. 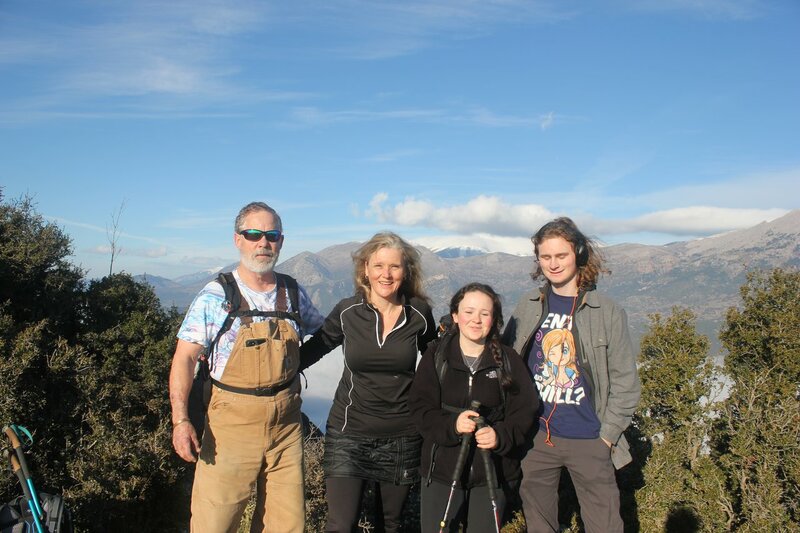 Each tour that was set for us was very punctual and the guides were all very polite and very generous and kind and always made sure we were comfortable and enjoying the trip. We were very pleases with every aspect of the trip. 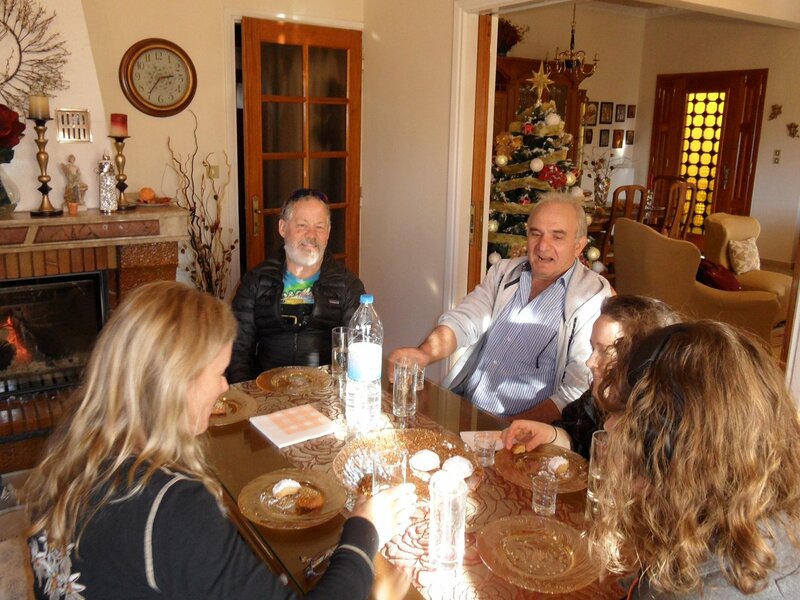 Tasos was wonderful in helping us plan this trip to our liking and was very pleasant. 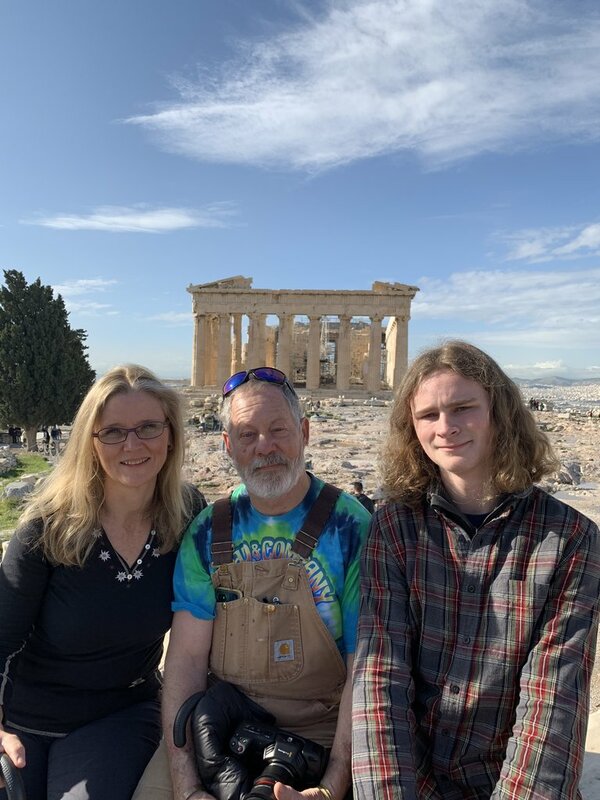 It was great meeting the two of you in Athens and I am very glad you enjoyed the trip! 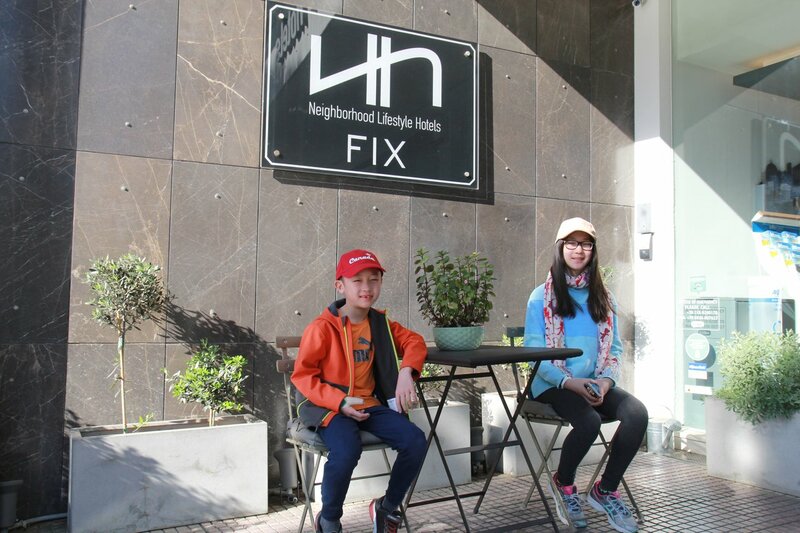 Looking forward to seeing you again at your next visit! We can’t say enough praise for Tasos and Travel 12. From the very beginning he provided constant, consistent communicate throughout the booking process as well as the trip itself. He made it very easy to communicate with him and his team during our trip if we had any questions or needs. Having concluded our trip, it is evident Tasos is proficient in his area and took great care and put such detail in planning our trip. He genuinely cares about his clients and their experience. 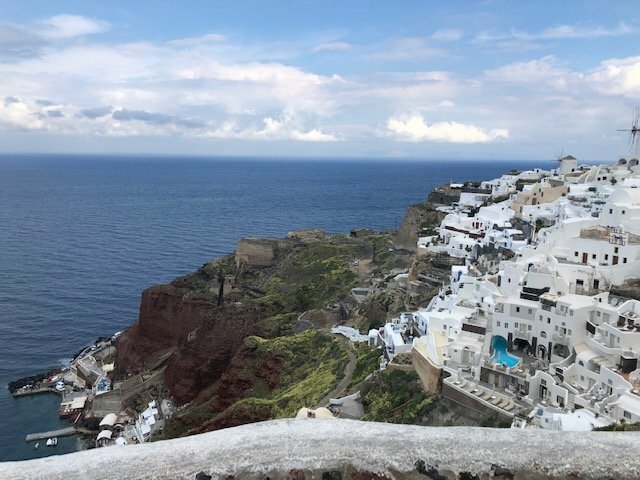 Tasos listened to our interests and created a trip that catered to our desires in addition to immersing us within the culture of Greece, both ancient and modern day. It was a perfect balance between touring time and free time. 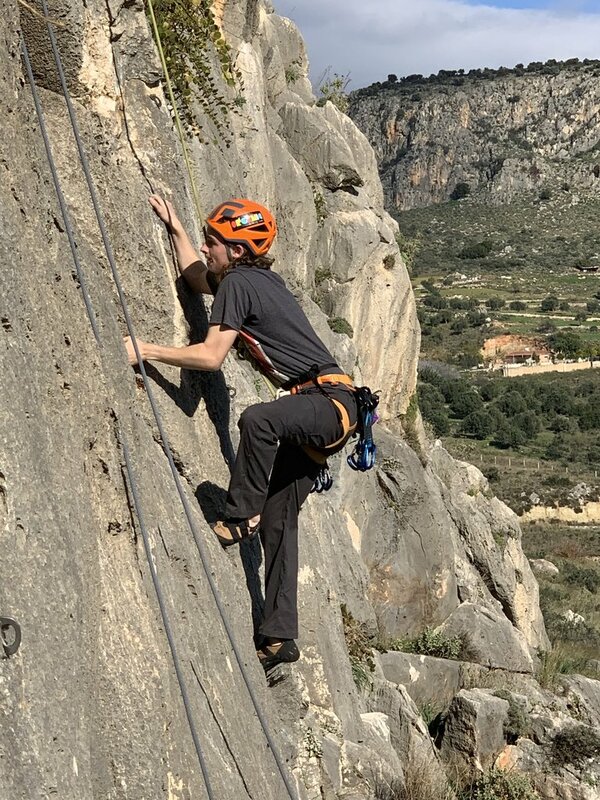 The guides Tasos scheduled were extremely knowledgeable, engaging, and affable. 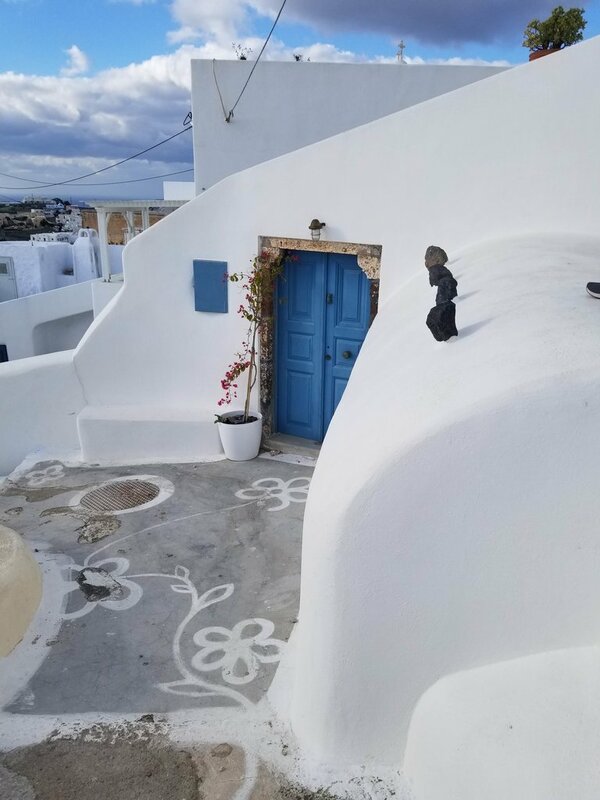 With each guide, it was evident care had been taken to select ones that were passionate about Greece, its history, and culture. They were all phenomenal. Ioannis (John) was our guide in Thessaloniki. 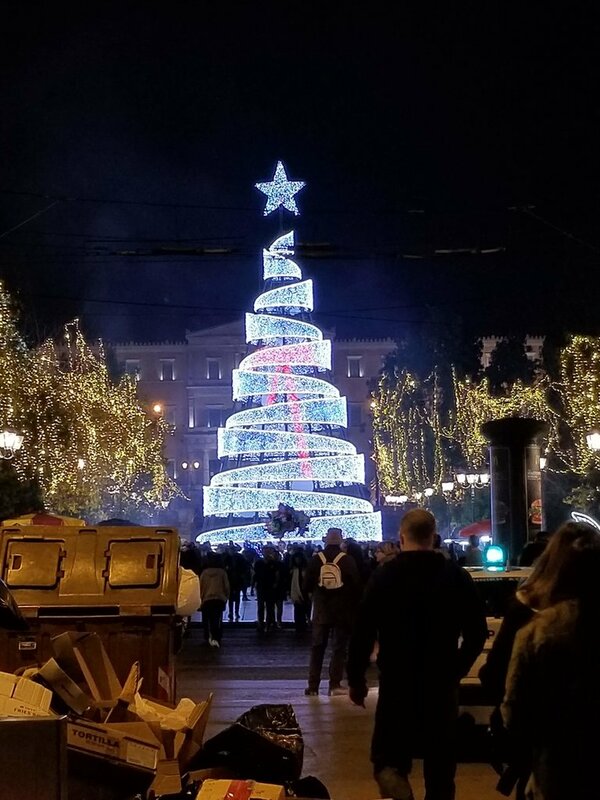 With the comfort that is present among friends, we strolled the streets of Thessaloniki and soaked up what he was teaching us. 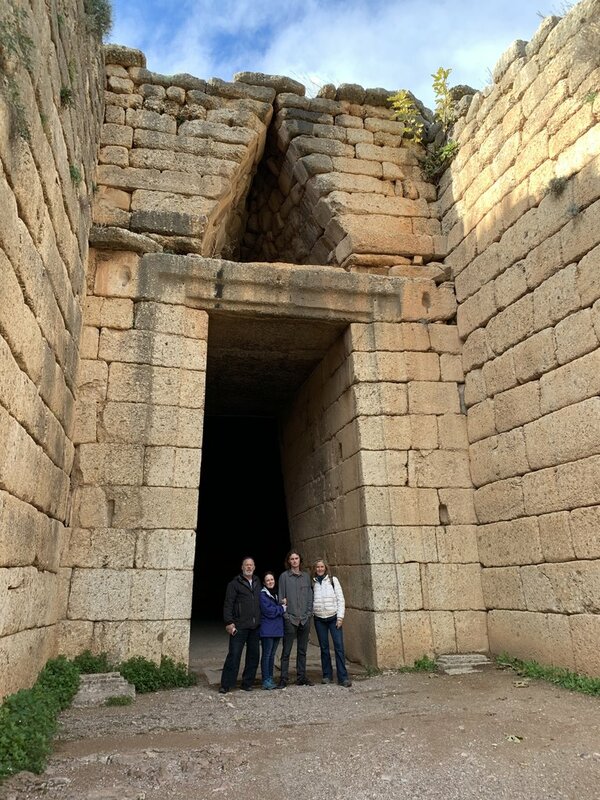 We had the pleasure of Anastasia touring us through Pella and Vergina. 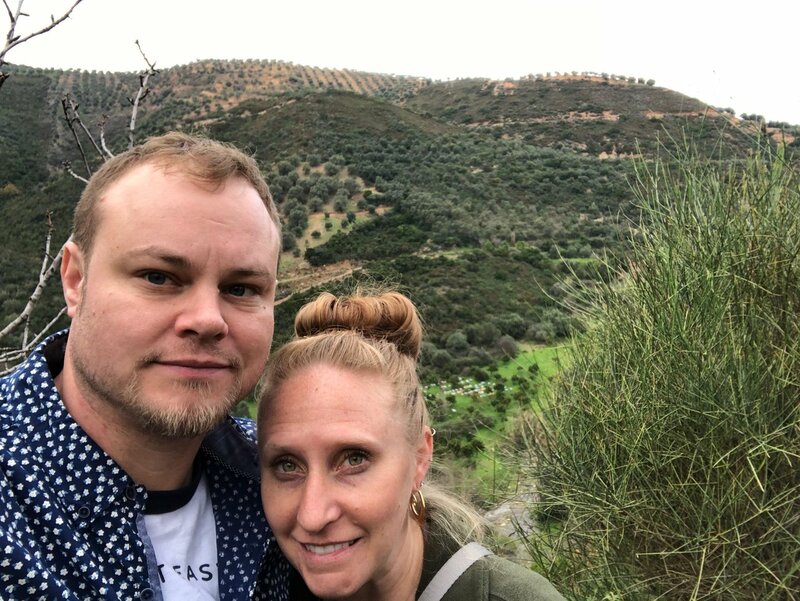 Upon observing our interest in Christian Biblical history she thoughtfully added an unscheduled stop in Veroia were we able to visit a tribute to the Apostle Paul and learn some of its history. 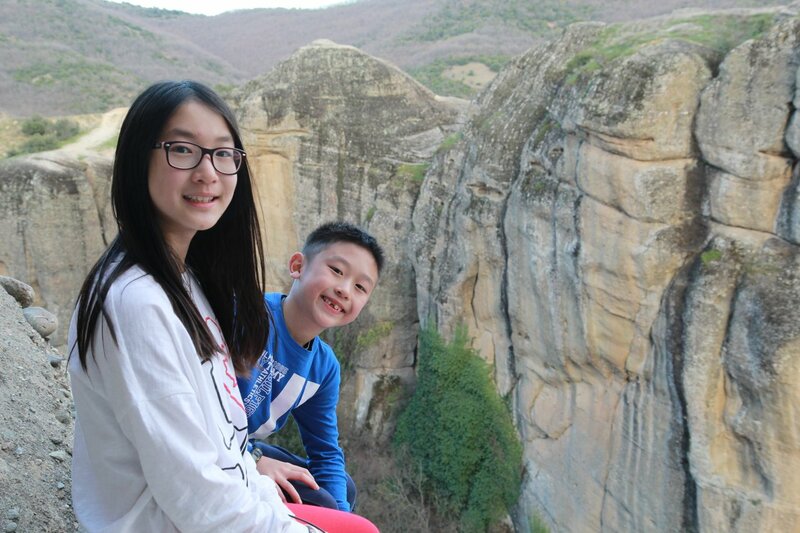 Vangelis (Evan) took us on our hike of Meteora (the rocks) in Kalabaka. I would definitely recommend this experience if you are physically capable and in the area. He allowed us to set the pace and was well versed in the history of the area. 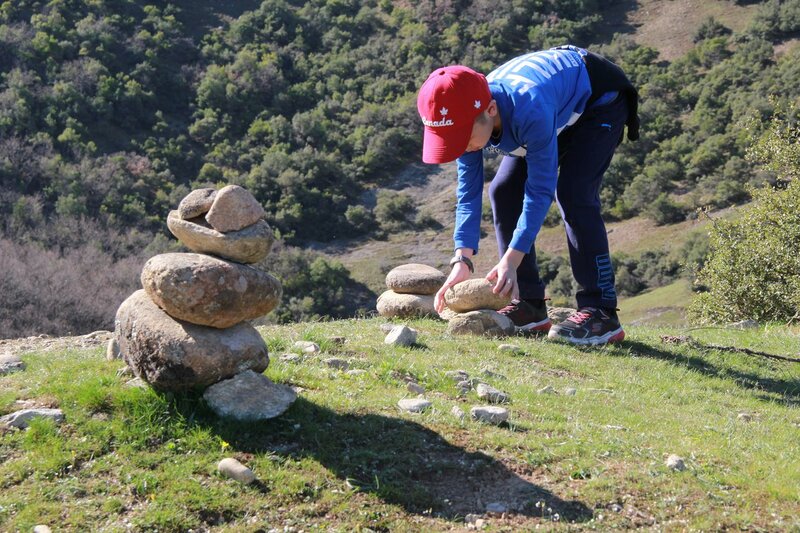 Not only were the views breathtaking but it truly added to the experience of visiting the rocks and the monasteries. Alexandria, a native Athenian, was our guide for Athens. 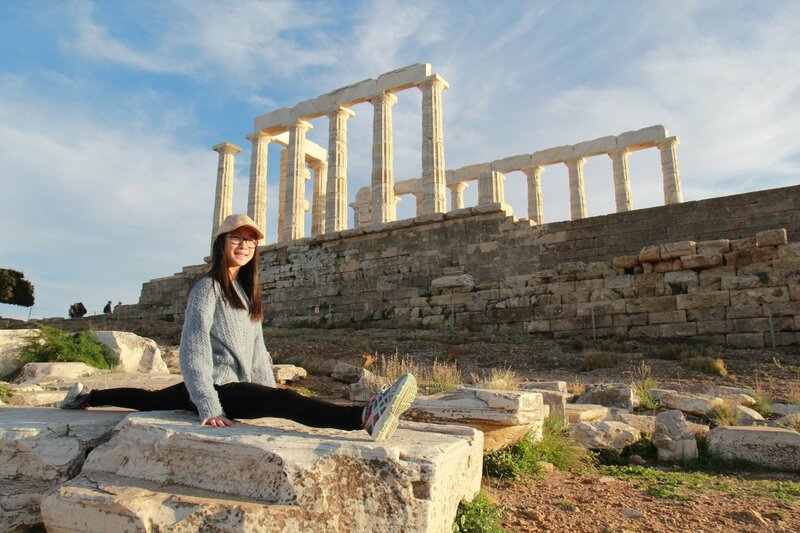 She was well versed in the history of Athens and local mythology. 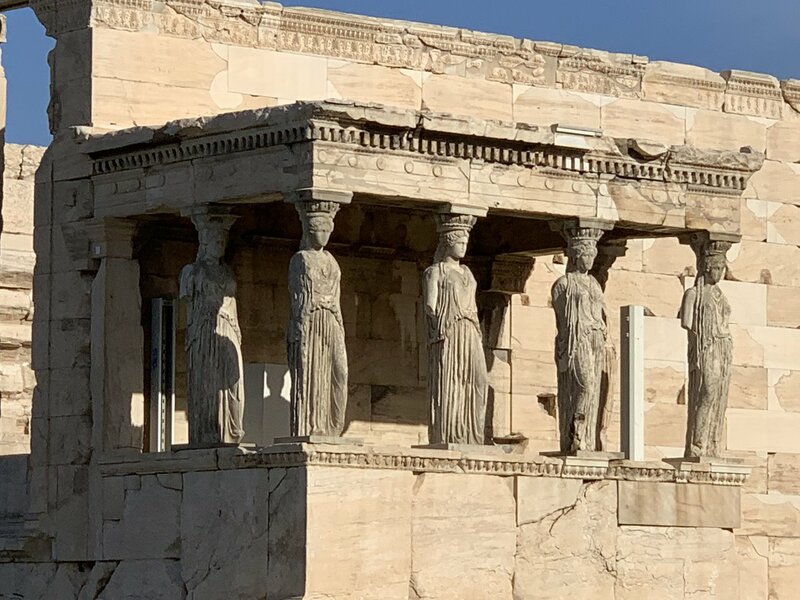 We toured the Acropolis, including the Parthenon, and ended with the Acropolis museum. 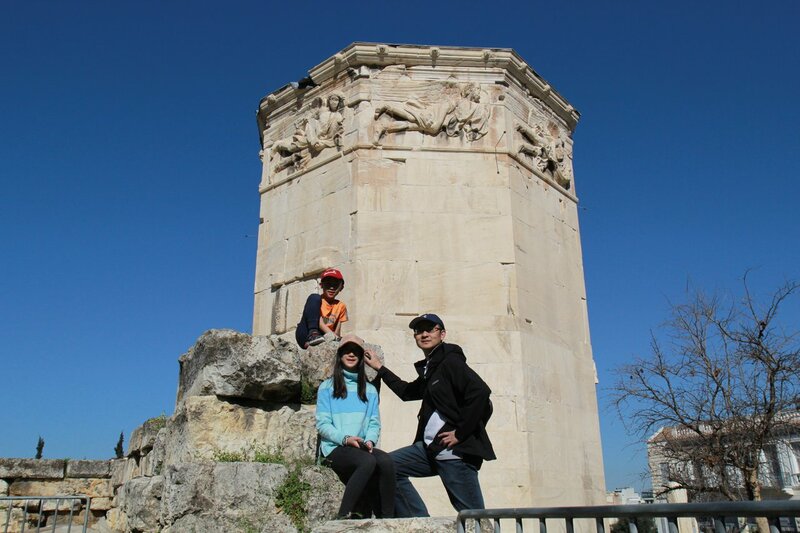 She even accommodated our last minute request to stop at Mars Hill, where Apostle Paul preached. 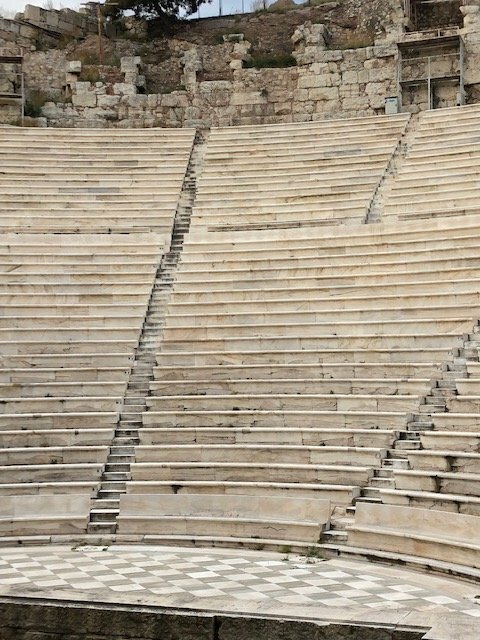 Then we headed to Corinth, Nafplio, and Epidaurus where our new tour guide had a college degree in history! 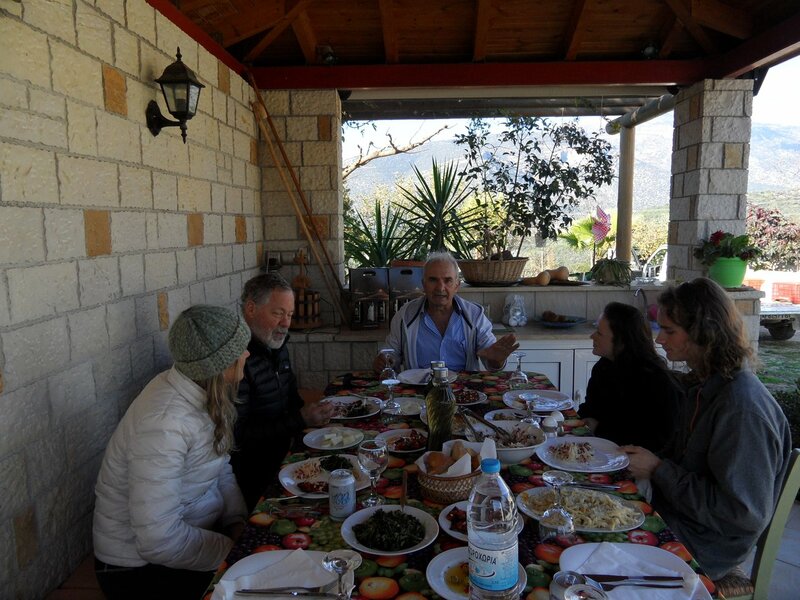 He also lived in Nafplio and treated us to a wonderful lunch where we felt like locals. We took the overnight ferry which was a new, yet pleasant experience. The rooms were larger than standard rooms on a cruise ship. 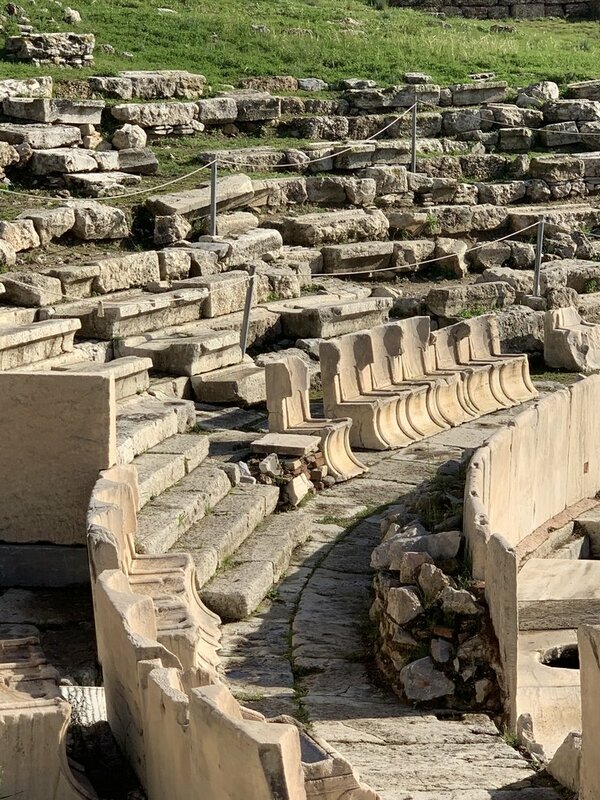 In Corinth we experienced another site where we learned more about Apostle Paul and got to walk down the paths he would have! Our guide was Katrina and she took us to the Palace of Knosos and the archaeological museum. Again, another guide (like all the others) that not only knew their stuff but was so very passionate about it! From there a father and son team, Demetrius and Yehanni took over. Each was a wealth of knowledge and a great personality- very vibrant, full of educational information, great company, and very competent. They truly made us feel like family by the time we left. 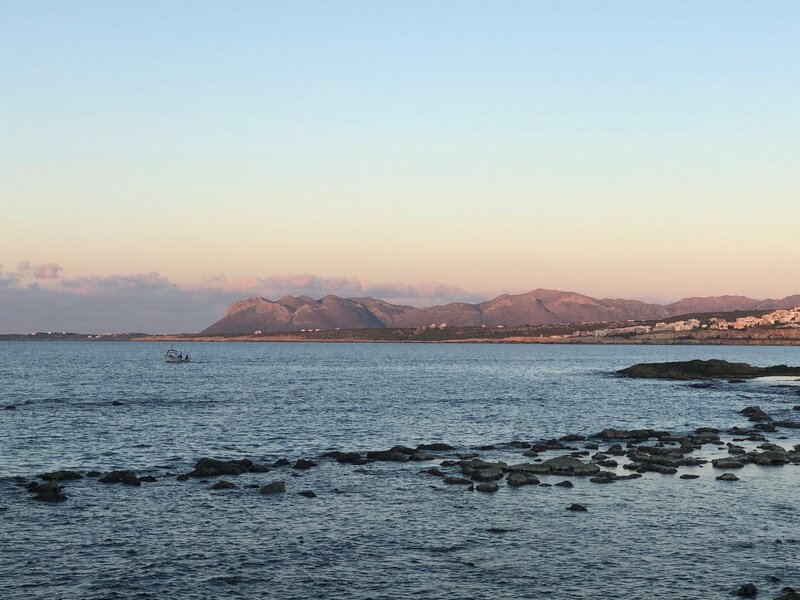 Yehanni took us on a tour of 7 villages where we experienced Crete that shouldn’t be missed. 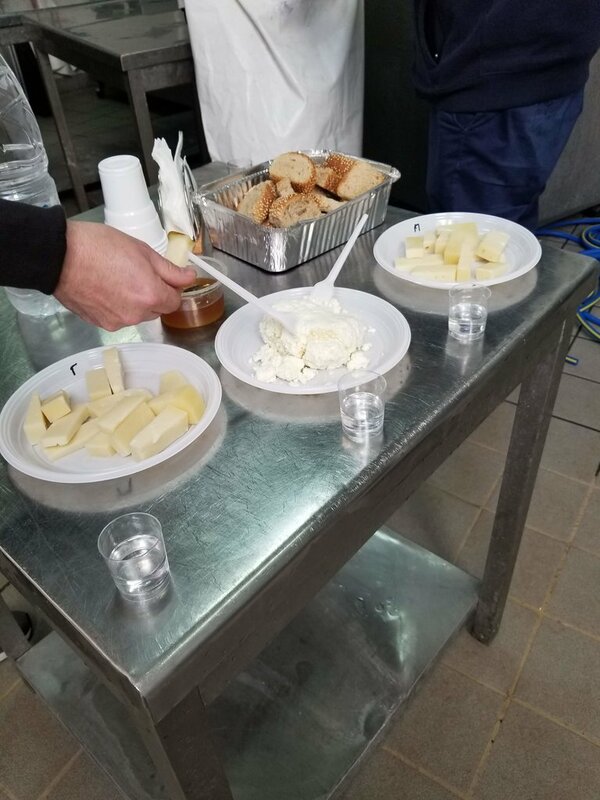 We had greek coffee in one village, visited a bakery in another, and a family cheese factory in another. Everyone was welcoming and patient with us. Our drivers were all courteous. They even allowed one in our party to sit in the front, passenger and “play tour guide” as she relayed information from them as we drove past areas of interest to them. In a sense, they were tour guides themselves. It was fantastic to be picked up each day by a driver and in a Mercedes passenger van to boot. We didn’t have to worry about anything as they had been given our schedules. All we had to do was show up on time each morning. Lampros was our most exceptional driver, and best dressed as he wore a suit each time we saw him, and made us feel special during our trip. 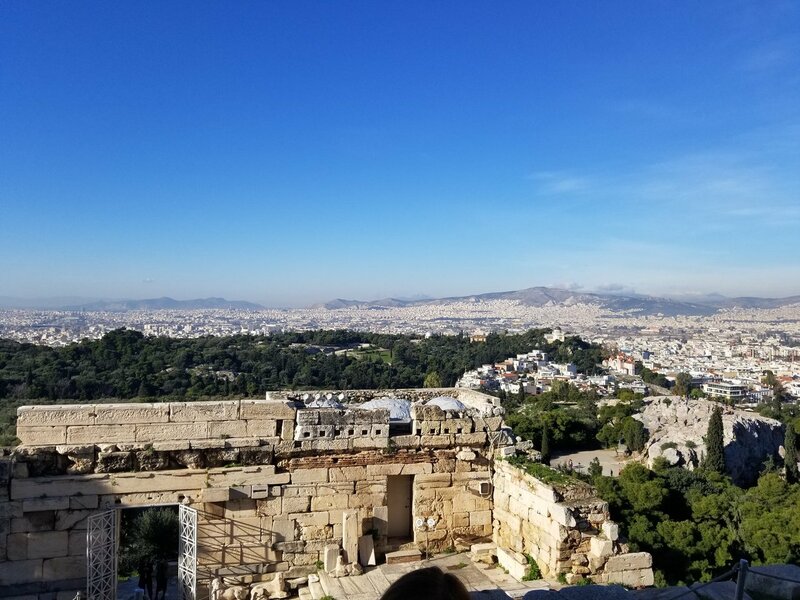 On our last night he made a detour and took us to an amazing overlook high above the city Athens that offered a stunning view of the city and the Acropolis at night. 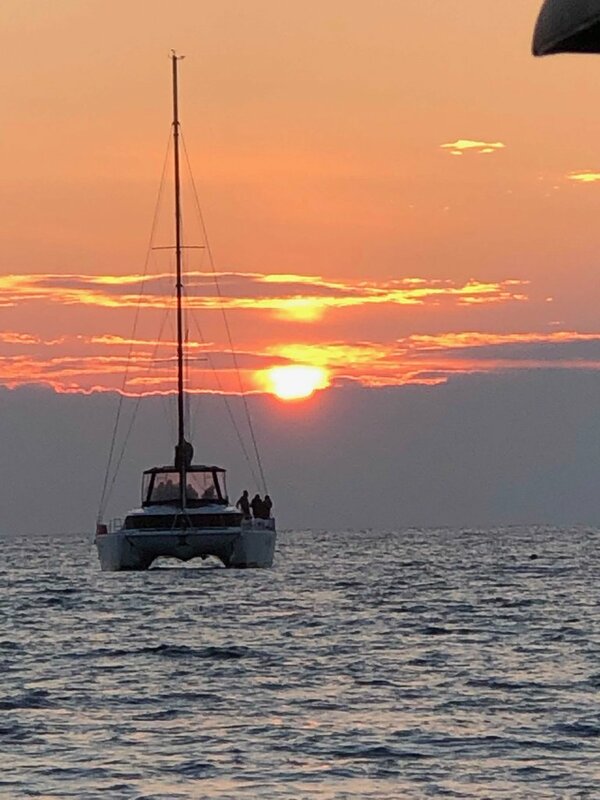 We walked away from this trip feeling very well taken care of, spoiled really, and having made so many memories that we will keep with us well past the next trip we book with Tasos. He blew our expectations out of the water and all four of us HIGHLY recommend using Tasos and his company Travel 12. Michelle, thank you so much for your beautiful words! 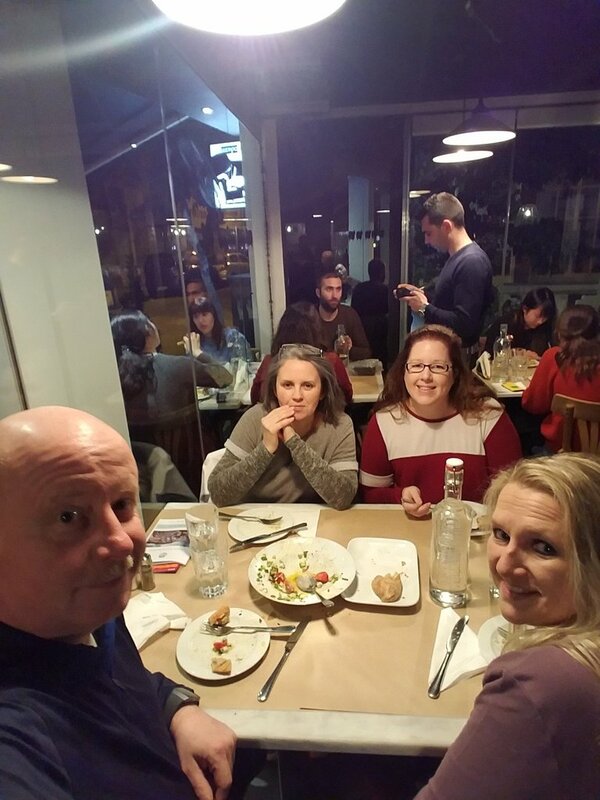 It has been a great pleasure meeting all four of you - even briefly - in Athens and I am extremely happy to know that I have helped in creating a special experience! I am truly excited to read the names of each driver and guide you met and to realize they have exceeded your expectations and made you feel at home. I wish you all the best and I will be delighted to hear from you again whenever you think about coming back to Greece. 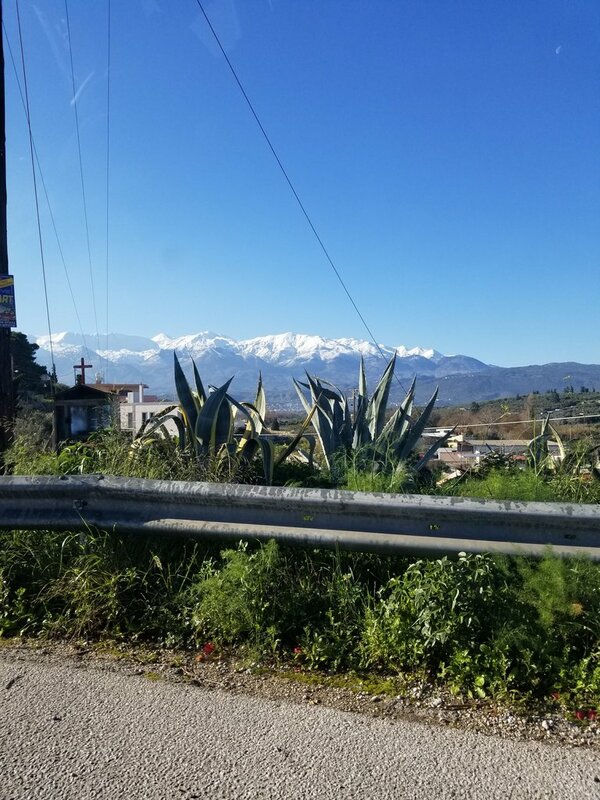 We recently completed a 9 day, self-drive tour of the Peloponnese organized, with our direction, by Tasos and his team at Travel 12. The logistics and trip arrangement worked out very well. The selected driving routes allowed us to see a great deal of the countryside, visit the important historical and places of interest and stay multiple nights in several centrally located hotels. These local, four-star accommodations ranged from very good to outstanding. Our guides, Ilias and Antonia, were excellent for the 3 included tours. Tasos and his team provided the right amount of support to get us on our way and keep us on schedule. This was on 'offseason' tour which we recommend considering. Popular spots such as Ancient Olympia and Mystras were not at all crowded. Days were generally sunny and mild. Think of March. Getting around by car is quite easy with Google Maps on your phone. The people are very friendly and there's a taverna on every corner. 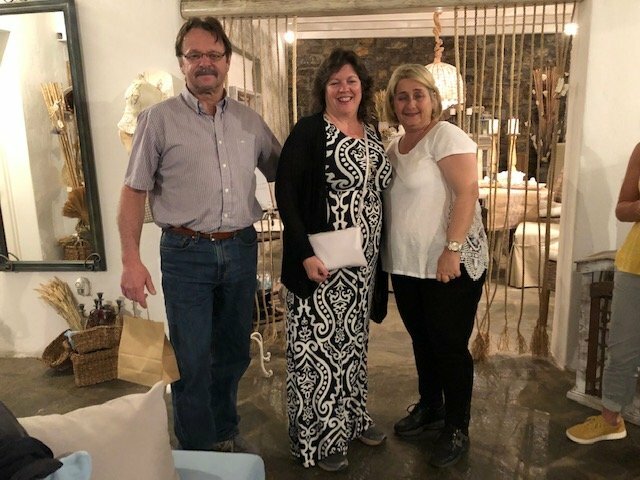 It was a great pleasure meeting the two of you in Athens and I am really glad you enjoyed your driving tour of the Peloponnese. 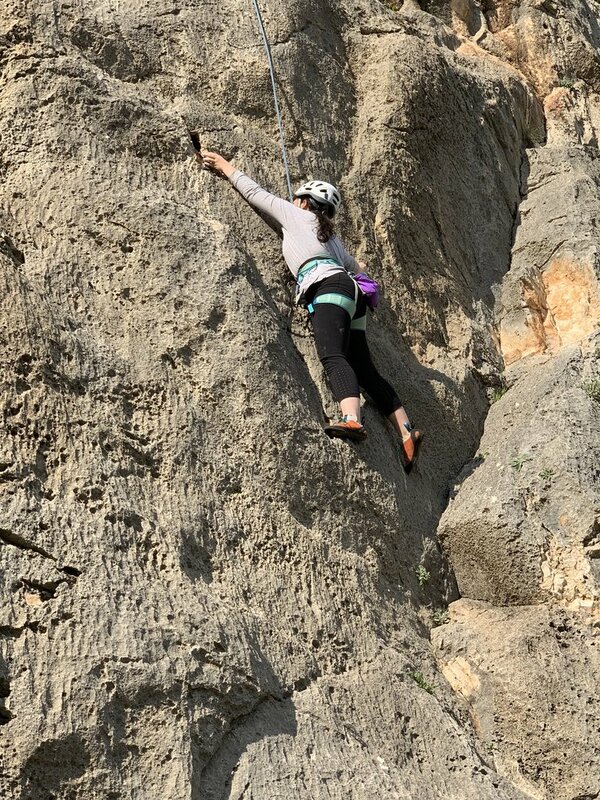 You did visit some of my personal favorite places and it's totally true that spring offers a great opportunity to enjoy the authentic side of these sites away from the crowds! First and foremost, we LOVED kimkim. 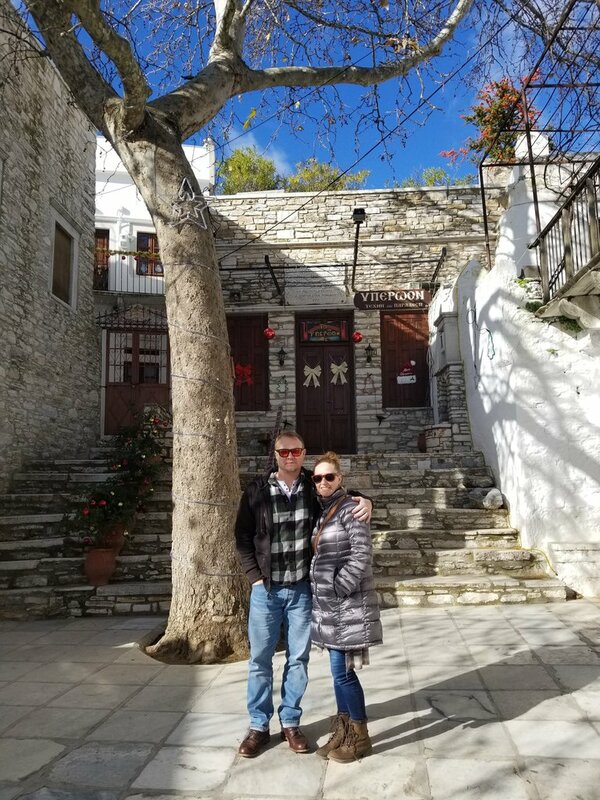 My boyfriend and I were so skeptical at first, but our local specialist, Tasos created a plan and a trip to Greece that was truly amazing. 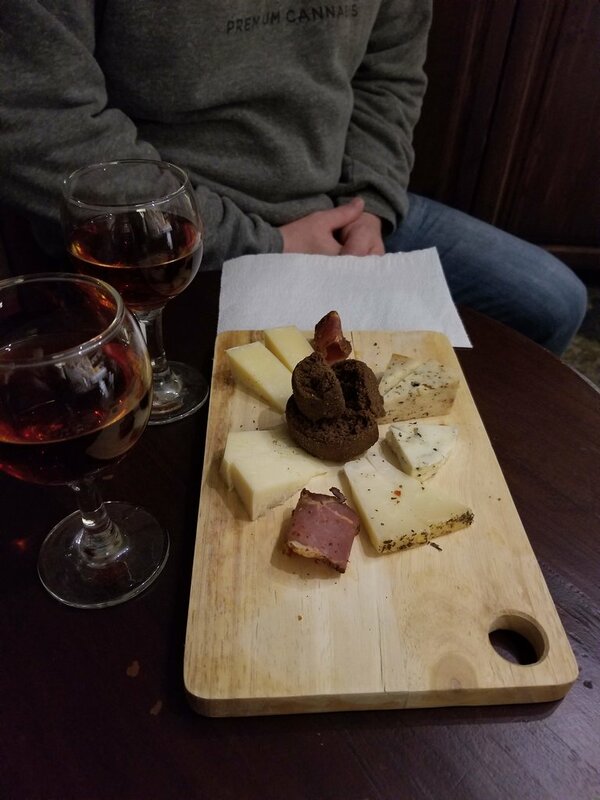 In the beginning stages of communication, I shared with him that we were very into food and wine, and love "off the beaten track" type sites. 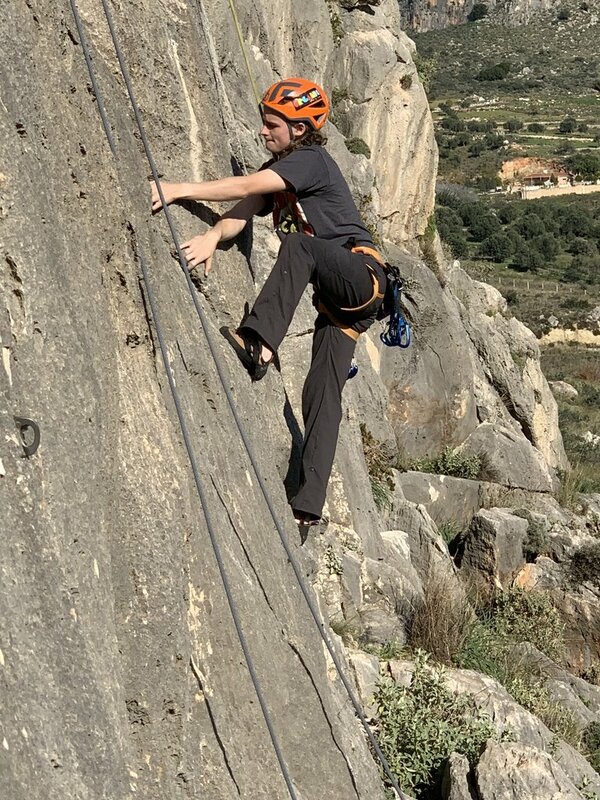 Tasos put together a few different itineraries for us, and we were able to pick and choose what looked most interesting to us. 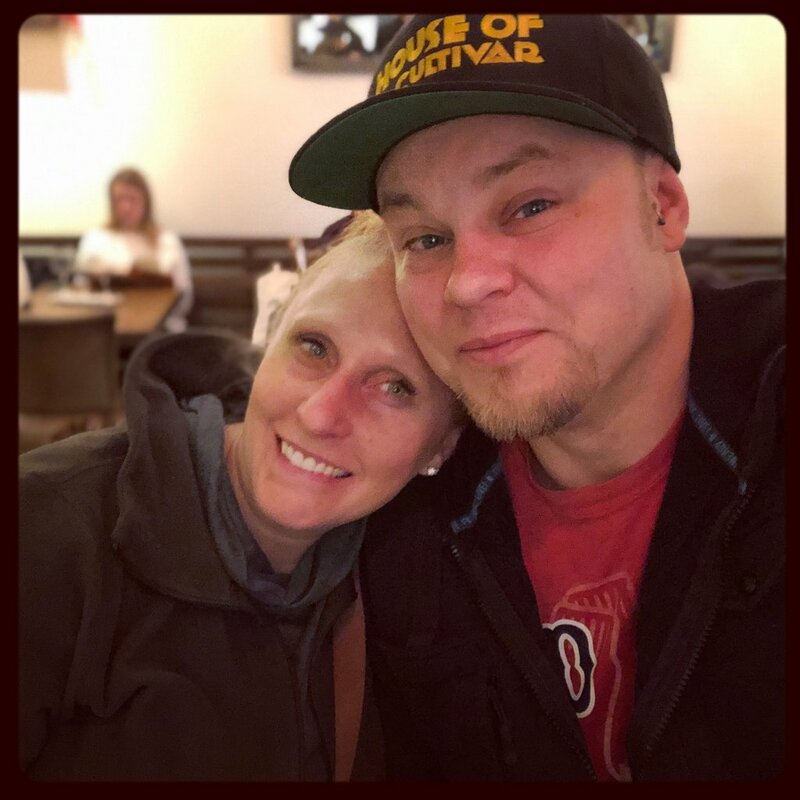 We were able to completely customize our trip to our liking. 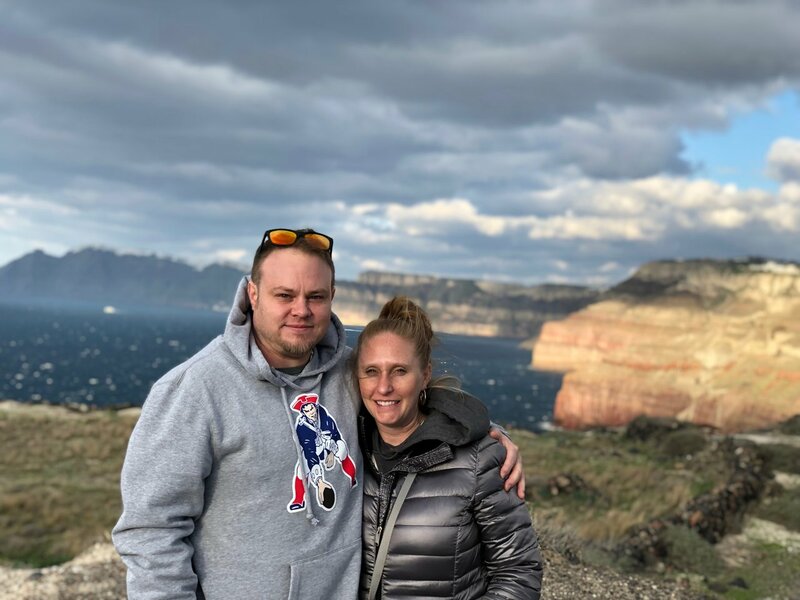 Tasos worked incredibly hard until the last minute providing us up-to-date changes (we traveled during the holidays, so some forms of transportation were hard to book), but he assured us that everything would be in place for us at an affordable cost! 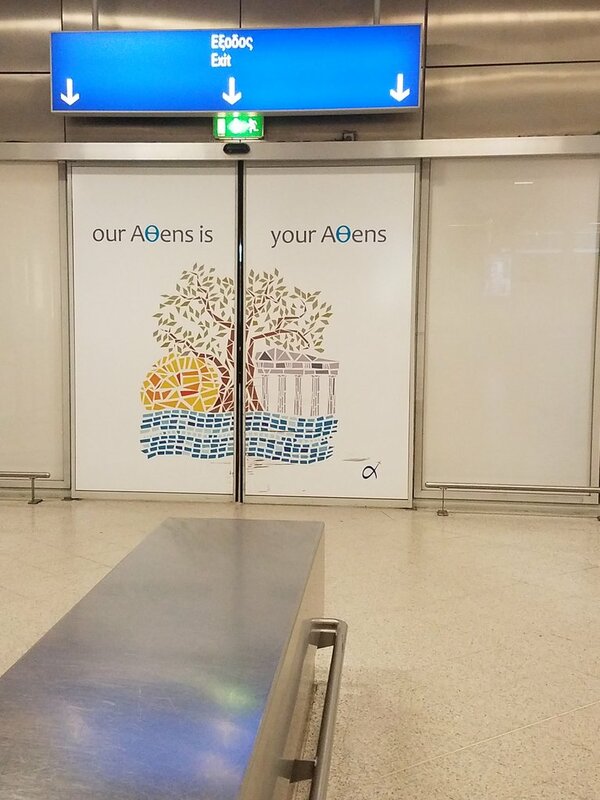 When we first arrived in Athens, we were greeted by a driver at the airport. He drove us to our first hotel and within an hour, Tasos came to greet us! He walked us around a little and gave us tips. From that point on, he gave us flight and ferry confirmations, and we easily were able to send email messages if we had any questions. He was super quick to respond, and we never at any point in time felt helpless or unsure about what to expect. Tasos arranged lunches, dinners, tours and transportation for us to every place we went. It was so comforting to know that there was always going to be someone waiting for us when planned. 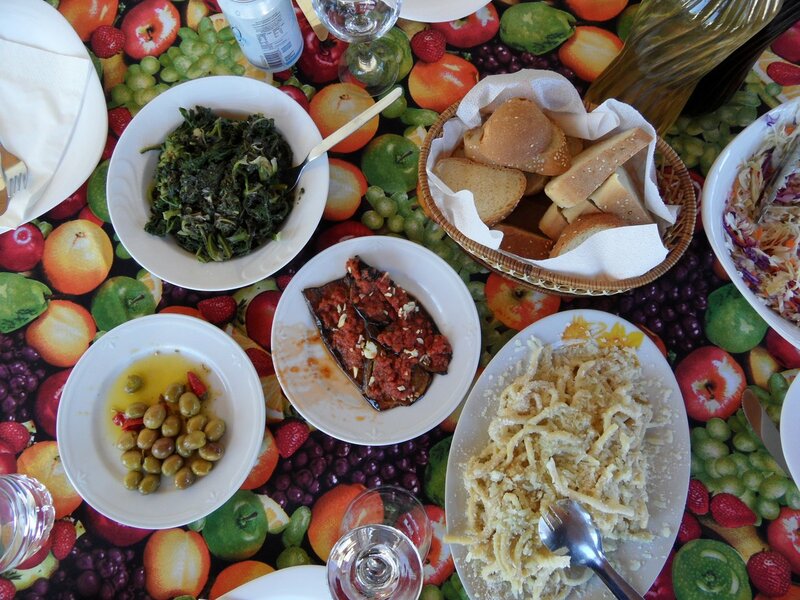 This service and Tasos made our trip to Greece unforgettable. I would have never been able to plan this on my own, and I felt like we were treated like royalty everywhere we went. Every detail was taken care of, and we were able to fully enjoy every aspect without any worry. I highly recommend working with Tasos for your trip to Greece!! He was incredible. In Athens, we stayed at the Pi Athens Suites. The room was big and clean and our concierge was incredibly helpful, and even called a restaurant for us to make a reservation one night. 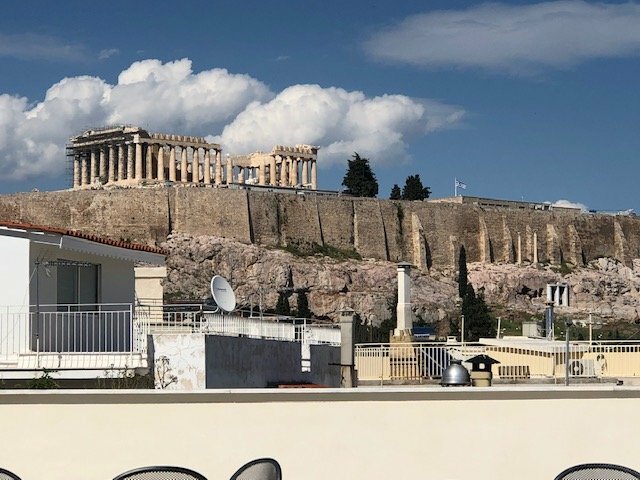 We were greeted with a complementary bottle of wine, and were able to watch the sunset on the roof deck with a spectacular view of the Acropolis!! It was located in a very convenient area, walking distance from everything. 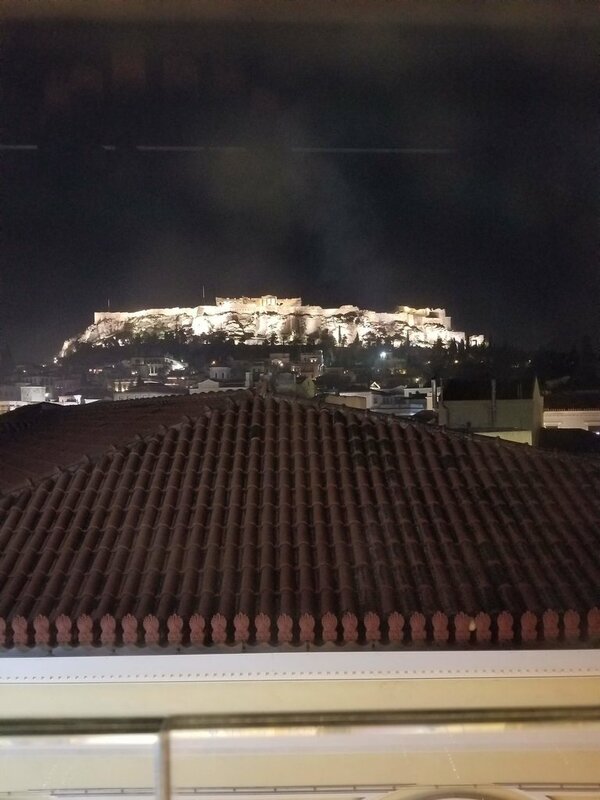 360 Restaurant: Amazing first meal in Athens with another amazing view of the Acropolis. The service was wonderful and the food was too. 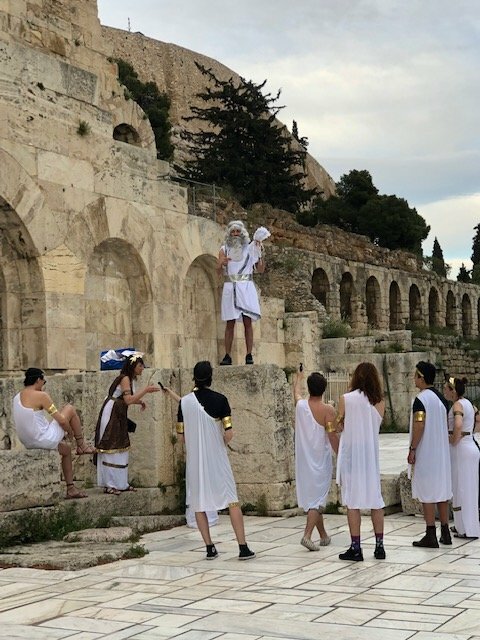 Alternative Athens Tour (Acropolis and Ancient Athens through a Mythology ): This was a great tour to see all the historical sites of Ancient times. Our tour guide Alexandra was so knowledgeable, and made learning about the history very entertaining and fun. I loved seeing the sites and stopping at a local cafe. It was just long enough, and I learned so much. We knew that it was going to be the off-season here, but were really interested in seeing the scenery and true nature of the island. There were not a lot of stores or restaurants open in Oia, the village we stayed in, but still was a great experience. Our tour was guided by Gabriel - it was a Santorini Highlights & Wine Tasting tour. 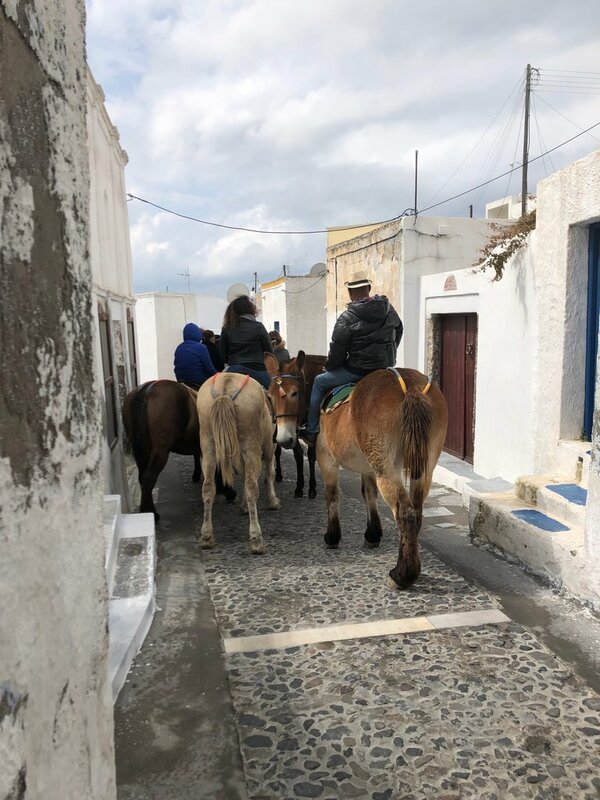 He arrived promptly and drove us around the entire island, telling us stories and teaching us about what life is like for a resident of Santorini. Again, we learned so much! He was hilarious and real, we truly enjoyed our time with him. 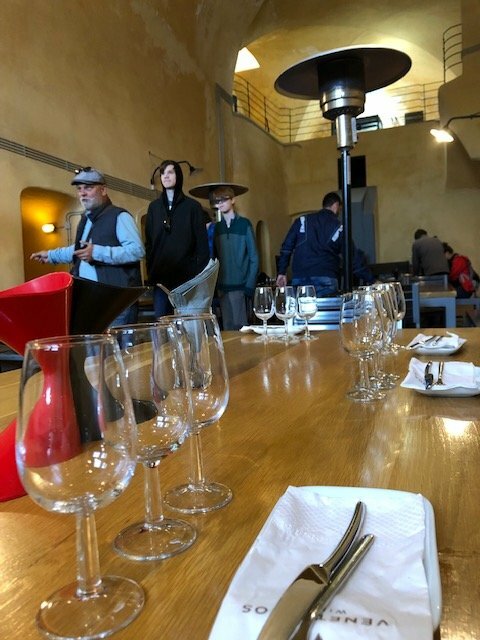 We had a wine tasting at Santo Winery and again felt like we were treated very special. 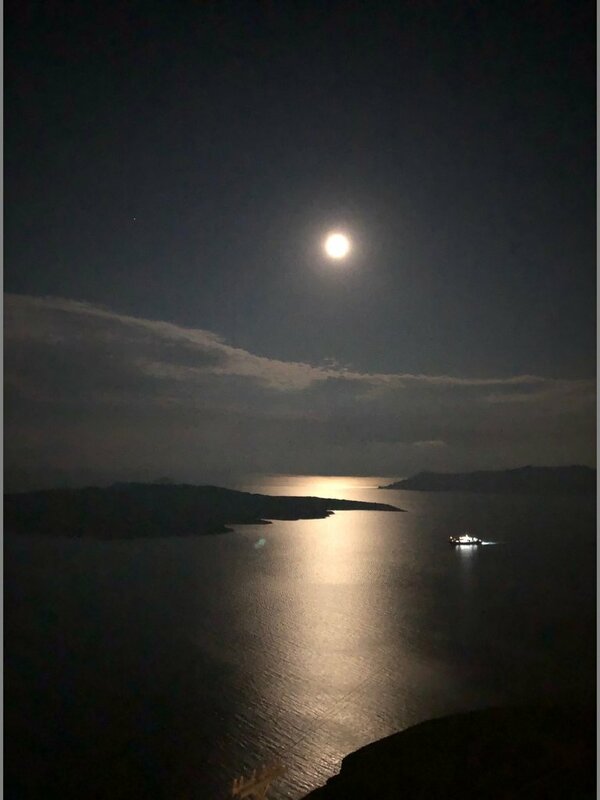 We flew from Santorini to Naxos and arrived in the evening. We stayed at the Xenia Hotel. Again, very clean room and the concierge was amazingly helpful, and also close to everything. We were shortly after greeted by our tour guide, Katerina. 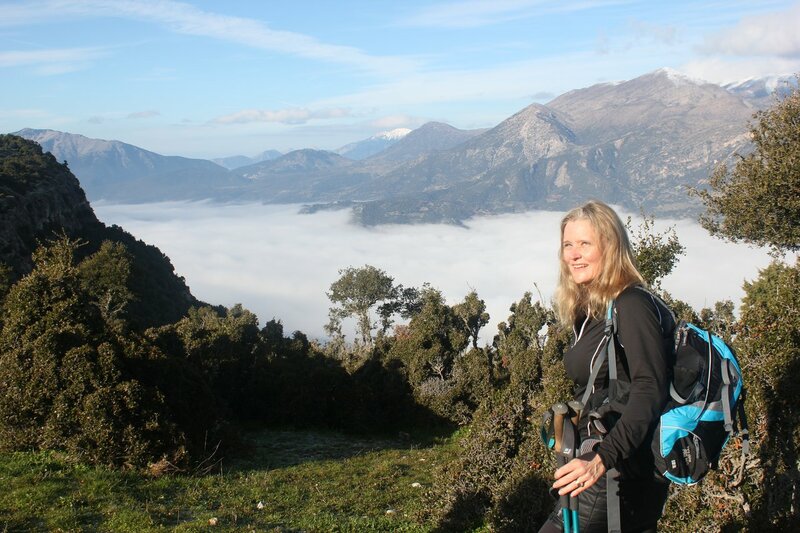 She was fun and bubbly, and super knowledgeable of all things Naxos, as she has lived there in a small village for her whole life. She brought us to a cheese shop and taught us about local Naxos cheese and wines, and told us stories about what life is like living there. We went to restaurant 1929, on the waterfront and had an enormous meal. Everything was delicious and service was amazing. We walked around after and she gave us a tip on where to get an after dinner cocktail. We went there and ended our night amazed and happy. Katerina met us the next day in the morning to show us around the villages of the island. 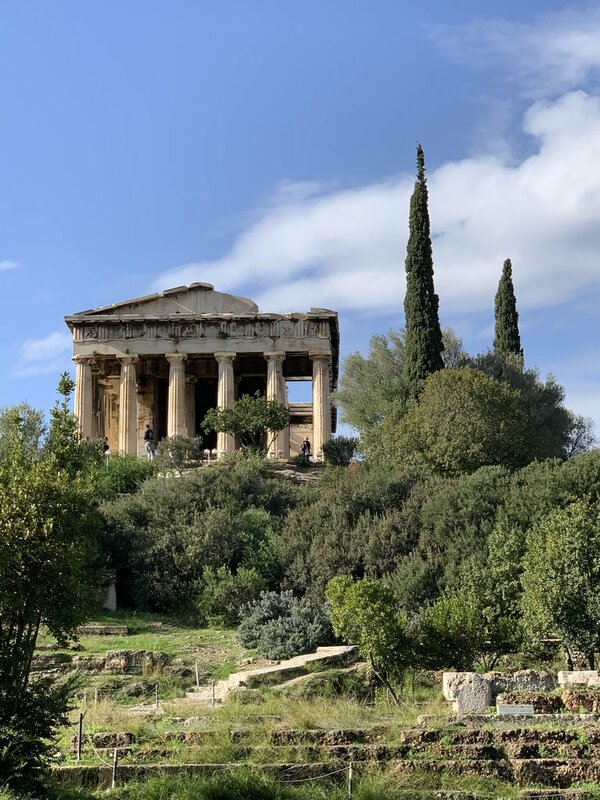 We saw the Temple of Demeter, watched a local spin pottery, and again learned so much. We sampled the islands famous liquor, Citroen, and felt like we had known her forever! Katerina made us feel so welcome and we enjoyed being with her so much. We plan to keep in contact with her as well, and we feel like we met a friend! The only complaint we had was that we did not get to spend more time on this island!! This was by far the best part of our trip. But, we sadly then had to leave Naxos and took a ferry to Crete. We arrived later in the evening and were brought to the Consolato Boutique Hotel. The street looked like a scene out of a movie! The room was by far the best of all the places we stayed and the gentleman in charge was helpful and hilarious, and gave us some great tips on where to go for dinner. 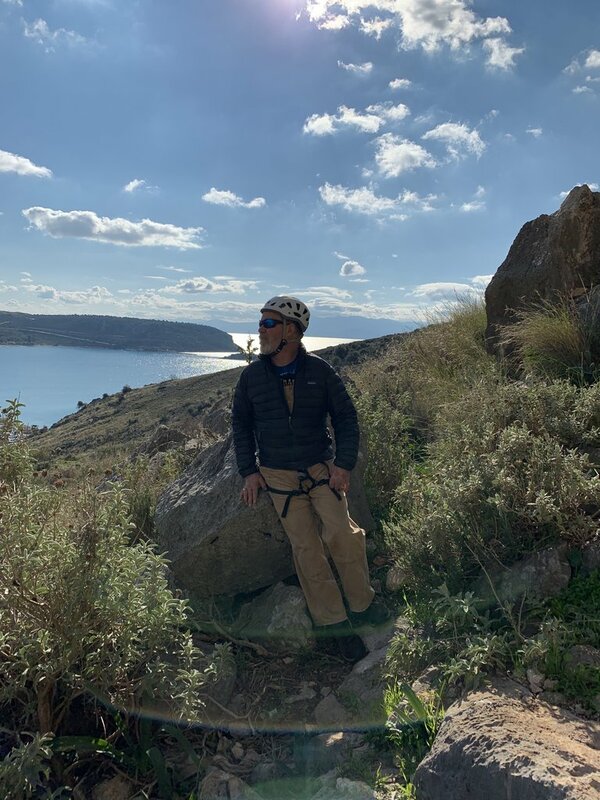 We took a tour of Crete with our tour guide Dimitrios. He drove us around the villages, got to see great views of the mountains, and we visited Dourakis Winery. We loved the winery tour and tasting (I did wish it was later in the day because we were tasting wine before lunch). Regardless, it was enjoyable and amazing still. 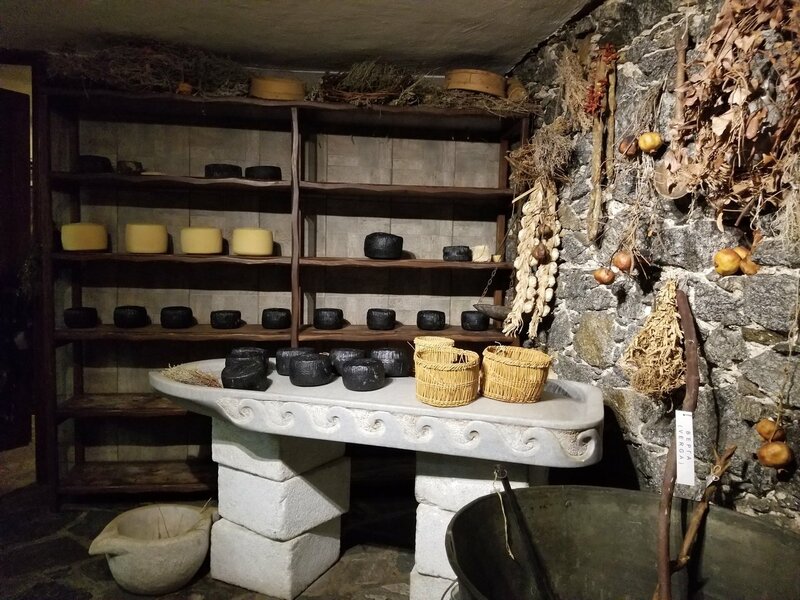 We visited a local cheese factory where we got to see all the steps to make the local cheeses, visited a bakery, and then were treated to a home cooked meal by some locals at a small tavern. Overall the tour again, was fantastic. 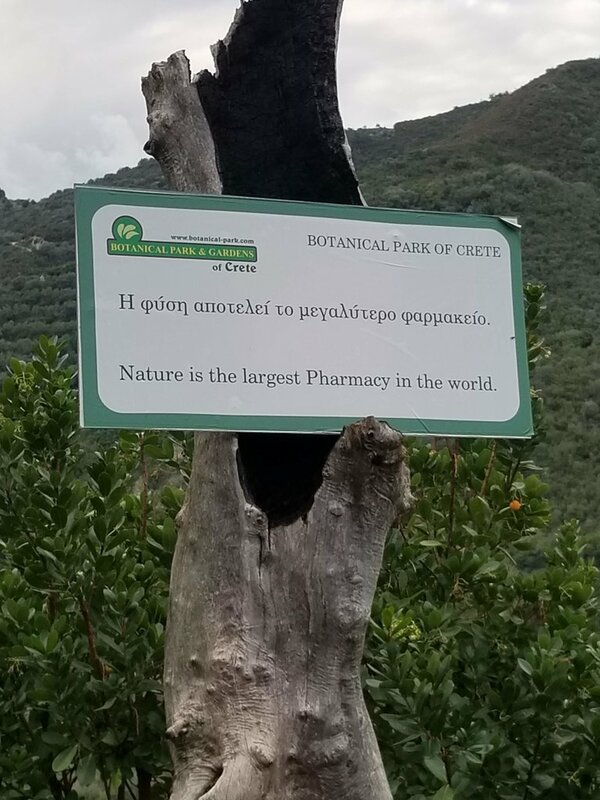 We visited the Botanical Gardens of Crete. 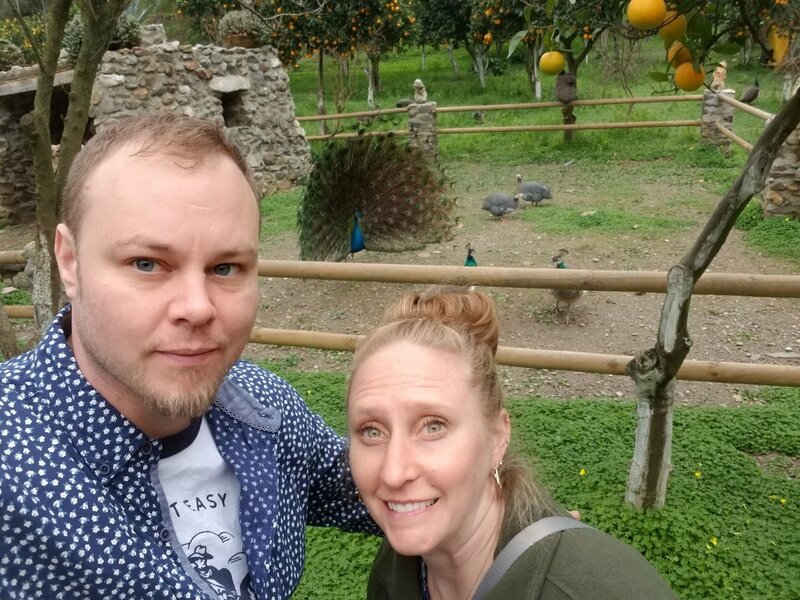 Although it is winter, we still enjoyed seeing all the plant life and tropical trees, as well as the animals (there were about 15-20 peacocks there!!) and enjoyed one of the best meals of the trip at the cafe at the gardens. I literally cannot say enough good things about our trip and Tasos, as well as all the tour guides, restaurants and hotels. We could not have asked for a better trip. It is so hard to even find anything to complain about, or anything we would have changed. We highly recommend using him for your trip to Greece, you will not regret it! Thank you so much for your kind words, Kate! It is just the best feeling knowing that you had such a great time in Greece. 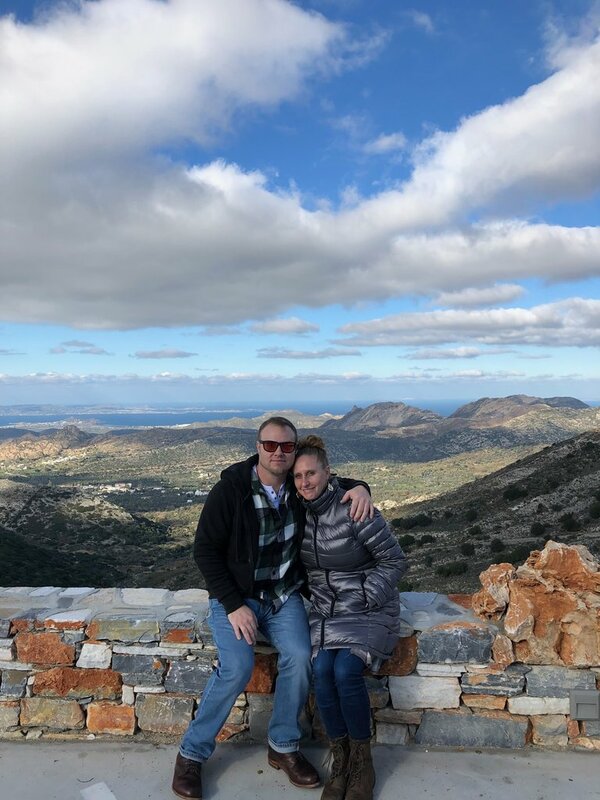 It is true you had the opportunity to discover the authentic side of Greece away for the summer crowds, and I am very glad that I helped you have a special experience! 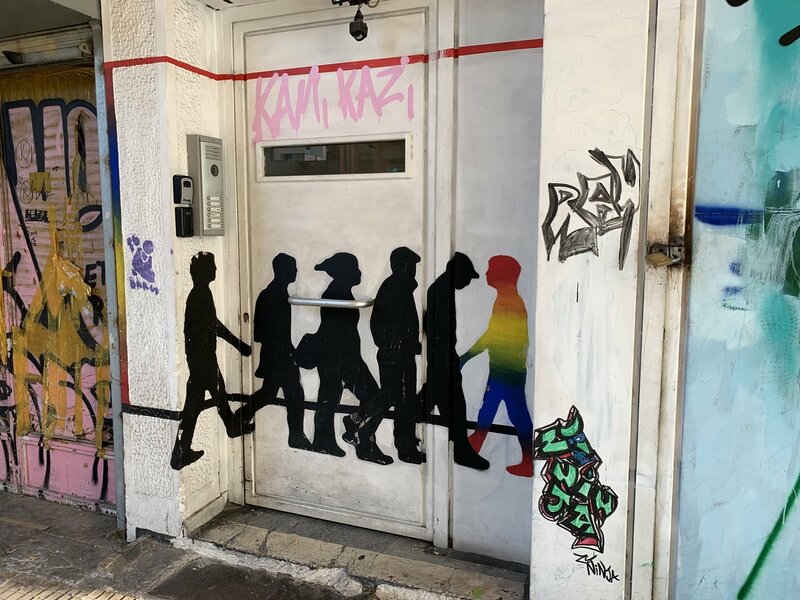 It was a real pleasure meeting you and Adam in Athens and I look forward to seeing you again whenever you plan your next visit! This trip so far exceeded expectations that it is hard to know where to begin this review. Tasos did an amazing job of customizing our 8-night trip to Athens and the Peloponnese to fit our family group’s unique mix of interests and personal style. 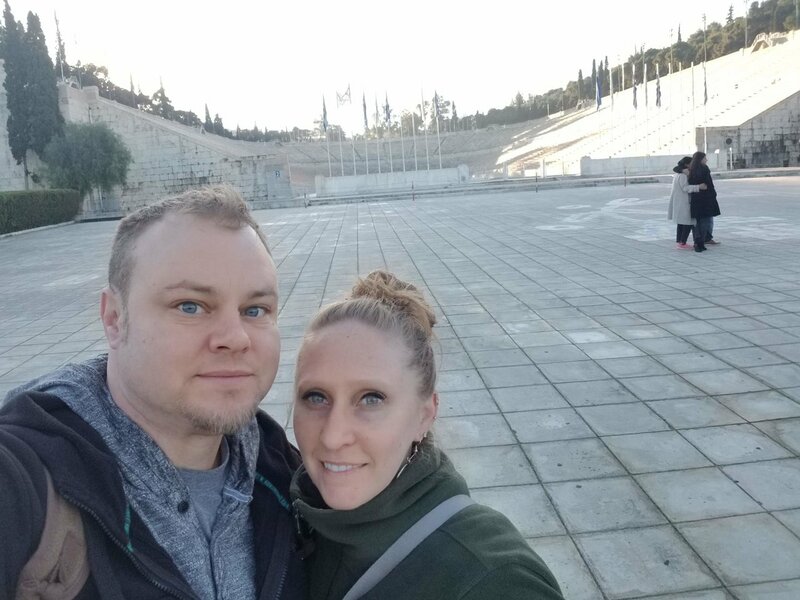 We wanted to and did take in some of the “must sees”, such as the Acropolis and other ancient Athenian sites as well as the Acropolis Museum, which we explored on a wonderful private tour focusing on mythology and guided by warm and knowledgeable former archeologist. Another day, we explored the Mycenae archeological site and beautiful coastal town of Nafplio with Ilias, a historian, as our guide. 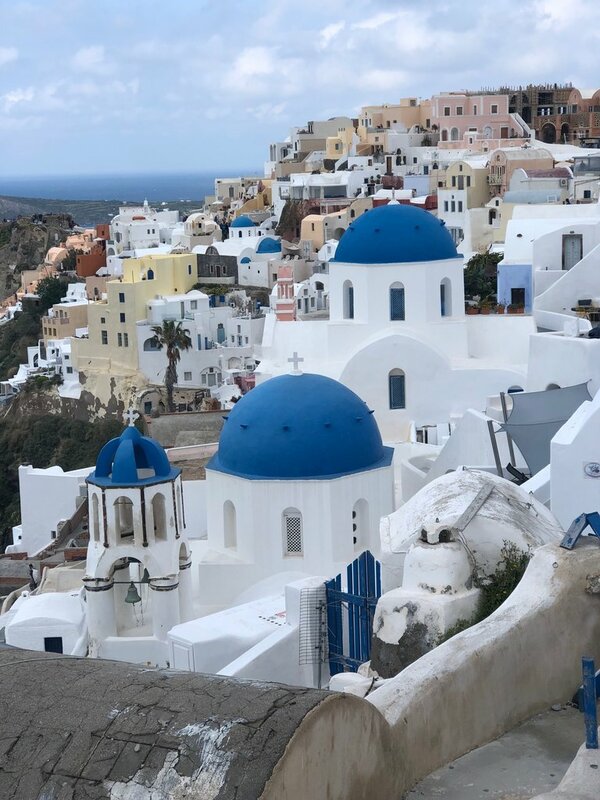 Although both these experiences were wonderful, and made all the more so by the relative uncrowdedness resulting from our unconventional choice to visit Greece in December, it was the more personalized experiences that Tasos arranged that really set this trip apart. These included: (1) a wonderful day of rock-climbing with a fantastic and knowledgeable guide, Kostas, who took us to a stunningly beautiful location on the cliffs near Nafplio with routes for widely differing levels of climbers and helpful instruction for those who needed it; (2) a spectacular mountain hike above the clouds guided by Nick, who provisioned us well with both equipment and a satisfying lunch and Mountain Tea prepared by his wife, Daphne (we asked for and were given the recipe for her raw cereal bars; yum! 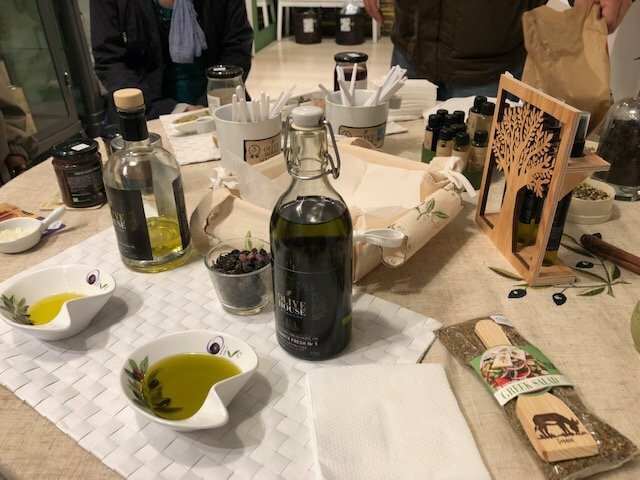 ); and (3) a visit to an organic olive farm and vineyard guided by Carola and effusively welcomed by farmer Dmitri and his family, who was the soul of hospitality and with whom we shared a wonderful home cooked lunch under his arbor; and (4) a tour of Athens street art with Niko (??? ), an engaging professional graphic artist. 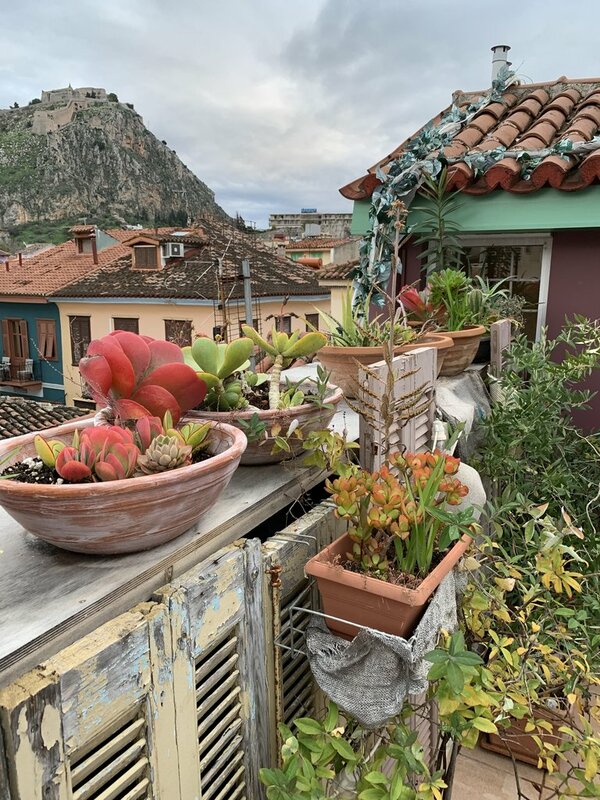 Our accommodations were all charming and comfortable, ranging from a magical old stone bed and breakfast far off the beaten path in the mountain village of Kefalari, to artistic and eclectic suites in Nafplio, to elegant hotels in Athens and the Athenian Riviera. Tasos and his team provided an extraordinary and thoughtful level of service. This included providing our party with a Greek cell phone with our itinerary pre-loaded and including google map links to all our destinations. 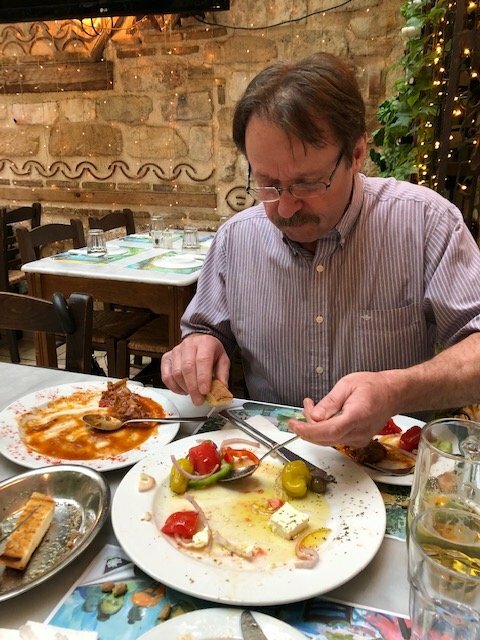 It also included the services of our wonderful driver in Athens, Lampros, who was fantastic in meeting all our flights (including a much delayed 3:00 a.m. arrival!) and getting us to and from our city tours. Tasos and Lampros even got me an appointment with an eye clinic when I arrived in Athens with a terrible eye allergy, and Lampros came with me to the appointment to translate. In sum, I cannot say enough good things about this trip and the incredible level of service provided by Tasos and his team. It was wonderful meeting all 4 of you and I am very happy you enjoyed your trip! 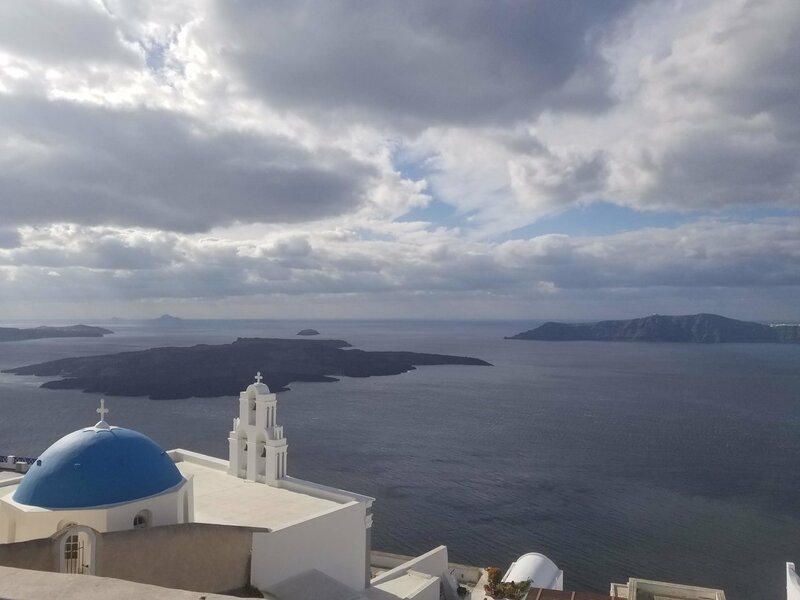 Your experience was a very special one to plan, as you experienced Greece in such a way that few people do, and visited majestic places that even Greeks often don't know of. I wish you all the best for 2019 and I look forward to helping you organize your next visit! 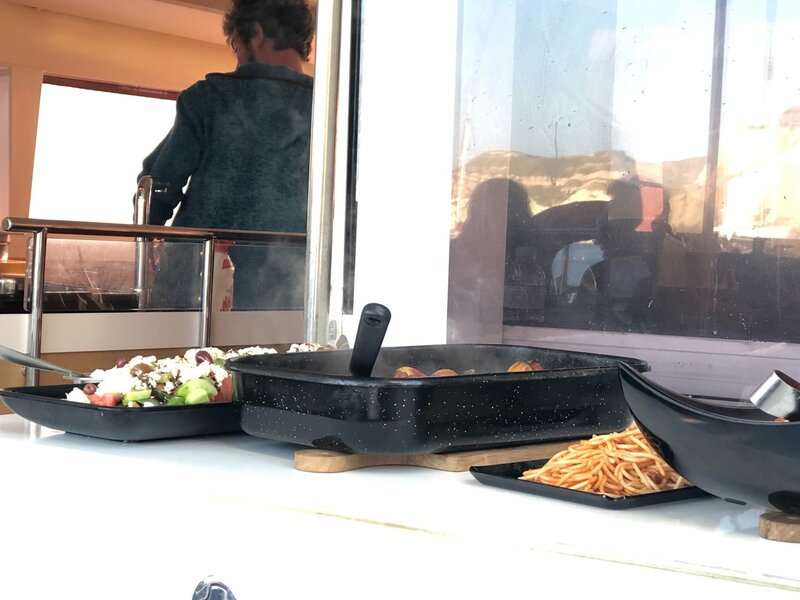 We arranged a driving holiday of the Peloponnese on the KimKim platform with Tasos as our local contact. We found KimKim to be an great way to organise our arrangements, find a local contact to make suggestions and the relevant bookings, and as a great communication platform both before and during our holiday. It allowed us to stay in contact with Tasos for any queries we may have had. Tasos and his team at Travel 12 were excellent from start to finish. The arrangements made throughout our holiday were perfect with no problems along the way. 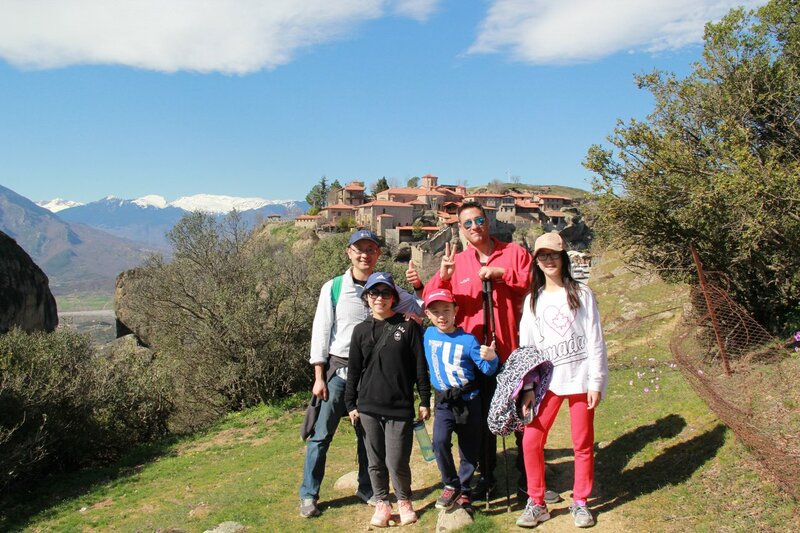 The hotels and itinerary were exactly as we had hoped and having a local contact like Tasos really paid off. Tasos was attentive to our requests and was quick to respond to any communications. He even arranged for some belongings we left behind to be forwarded to another hotel along the way for us to pick up! Although we never met in person, on our final day one of his team visited us as we were waiting to go to the airport with a small parting gift. We could not recommend his service highly enough. I am very happy you enjoyed your trip. It is true you visited some of the most beautiful areas of Peloponnese and some of my favorite ones. Next time I hope we'll have the chance to meet in person. Have a wonderful summer! 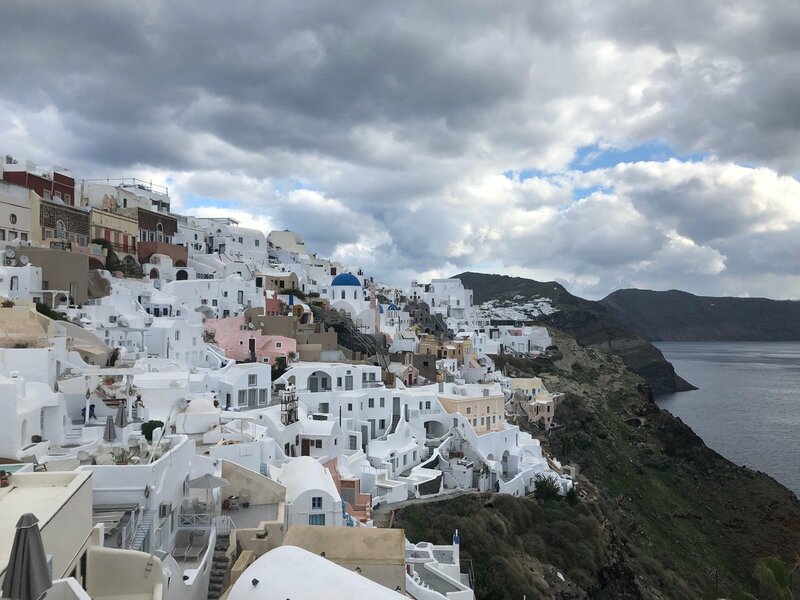 We did a two-week custom tour, with guides, hotels, ferries, transfers, etc Tasos helped me come up with itinerary and responded to my questions and suggestions. He was great. It was pretty complicated but it went off without a hitch. When I had questions, Tasos was great about getting back to me quickly. 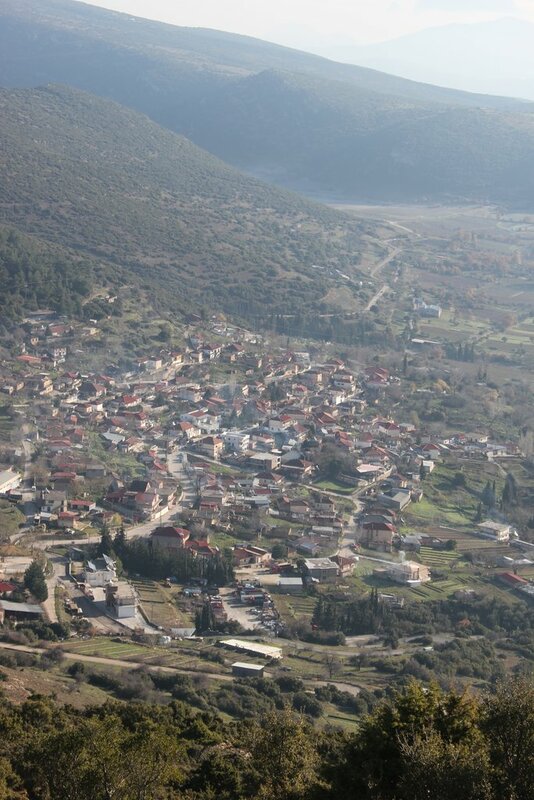 We went from Athens to spetses, Napthia, micenae, Olympia, Navpaktos, meteora, and Delfi. 3000 years in 12 days. Greece was amazing! I am very glad you enjoyed your trip. It was demanding but a real pleasure to plan. You visited some amazing places indeed, and there's definitely more for the next time around. Wish you happy and safe travels. While we had a really good trip, we were honestly a bit disappointed with the city of Heraklion. 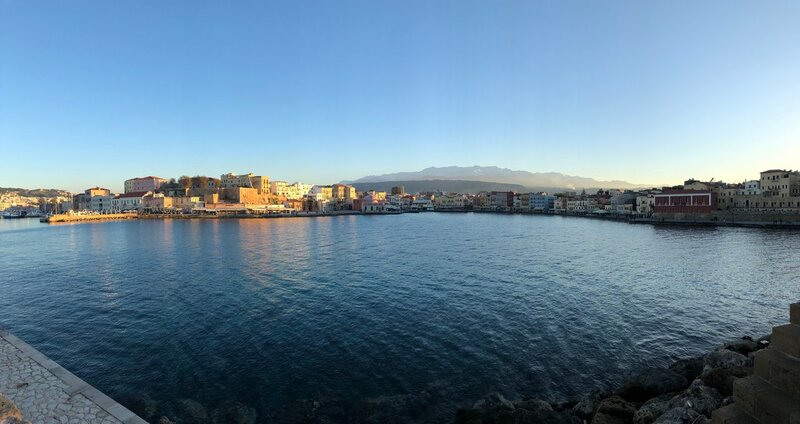 (Should note that we originally intended to go to Chania, but we 'accidentally' booked flights to Heraklion, not realizing there is more than one airport in Crete. Perhaps we could have been steered further away from Heraklion, or just driven out for more day trips from there.) The pedestrian areas there were nice, and George did a great job w/our food/wine tour; however, it was almost frightening to walk around much of the city, since motorcycles abound on the myriad tiny, winding streets. 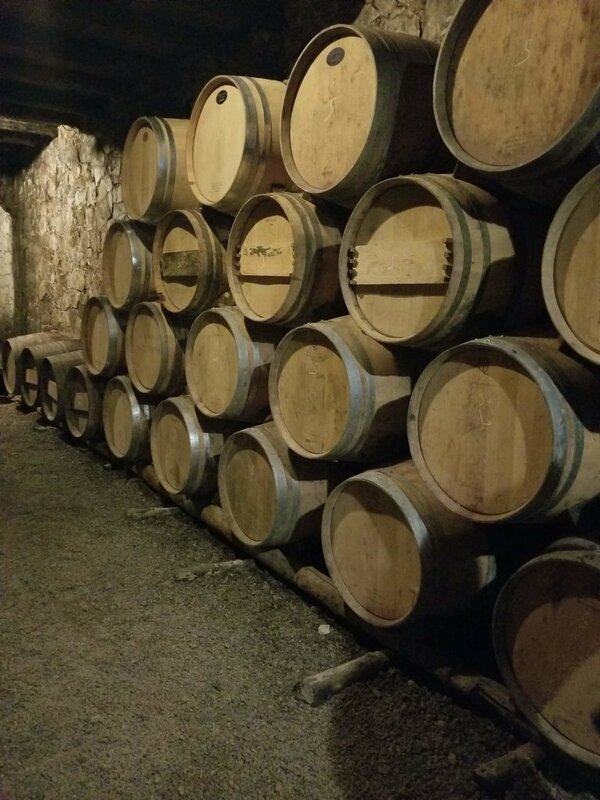 We did thoroughly enjoy our wine tour to Douloufakis, as well as our olive oil farm tour to Koronekes. Our driver, Alexandra, was great! Always on time and very friendly, as well as an expert on touring commentary, especially cultural comments. 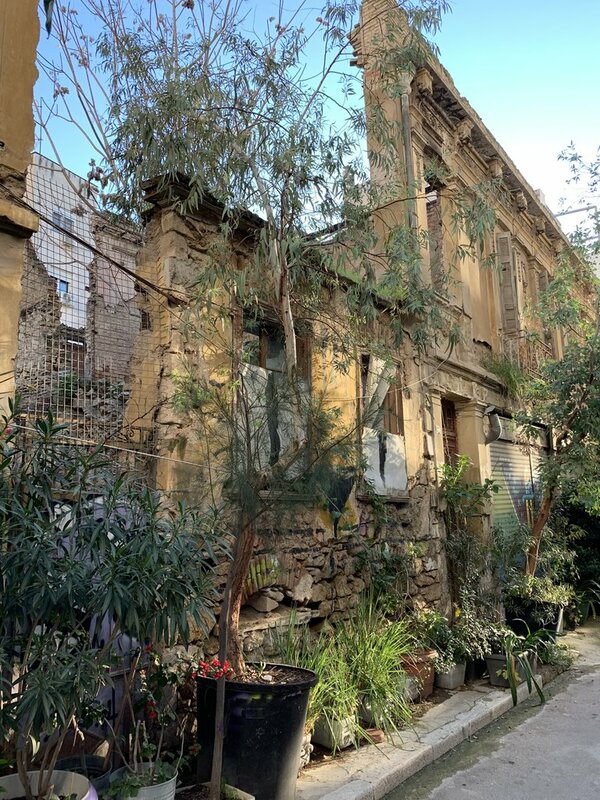 Tasos was very kind and generous in taking good care of us, and again, a good trip, but would definitely have done a few things differently had we known that Heraklion probably lacks much of the charm that Chania apparently has. KimKim is, however, excellent to work with, always answering questions quickly, and very attentive. Thanks! Thanks for your feedback. I appreciate what you would have expected of me, as I strive for continuous improvement and service excellence! 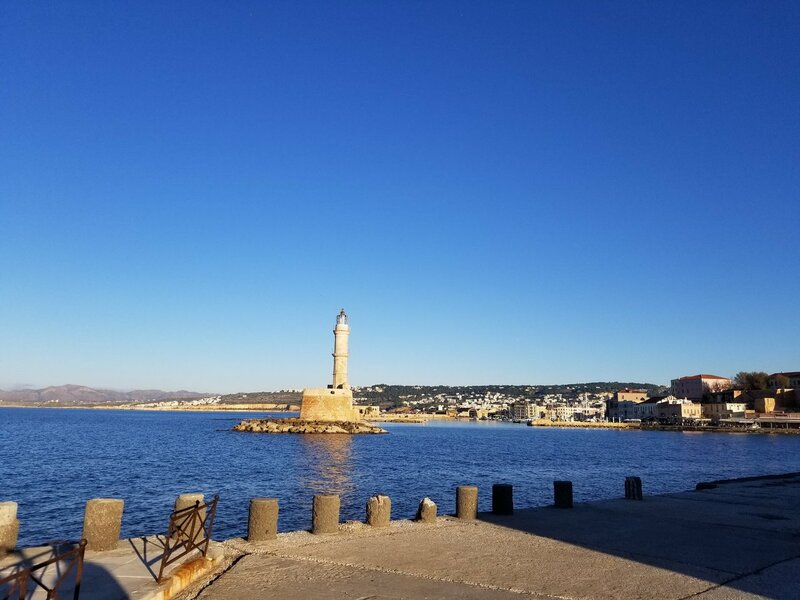 - still, you are disappointed that you ended up in Heraklion by your own ‘accidental’ choice (as I initially proposed a trip built around Chania and you asked me to change after booking your own flights for Heraklion). 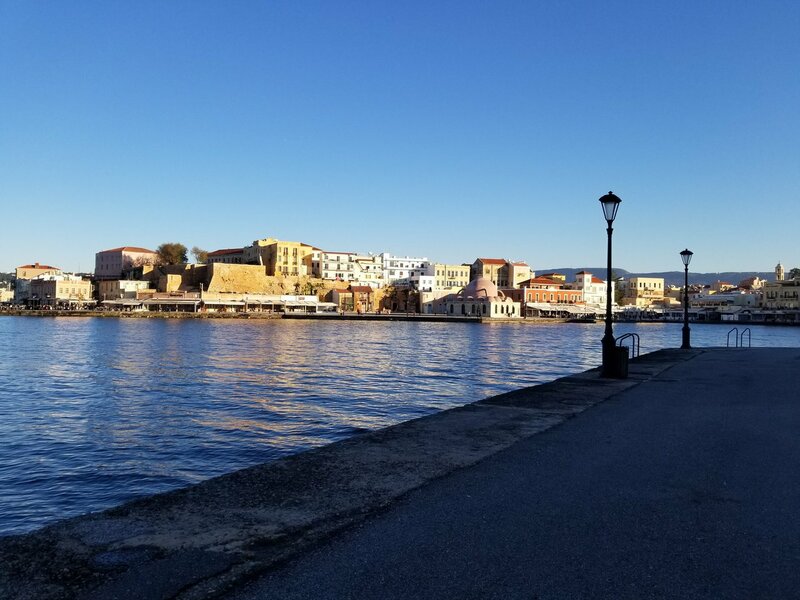 Anyway, I am glad you enjoyed most of your trip and I would be happy to help whenever you decide to come back for Chania or any other charming area of Greece. This trip was overall great. We made the best of all the mishaps but those were not many. Only issues we had were finding a driver for our first transport. The others were small such as time changes for a tour which we ultimately missed (we ended up on the wrong tour), but the tour we did go on ended up being wonderful so it wasn't really a big deal. The tour guides and drivers were all friendly; communications with our Greek specialist, Tasos, were prompt and efficient whenever we had questions or issues. Tasos kept in touch with us to make sure that things were going smoothly or altering plans to ensure we had a hassle free trip. Greece was beautiful and it would be hard to have a bad time there. 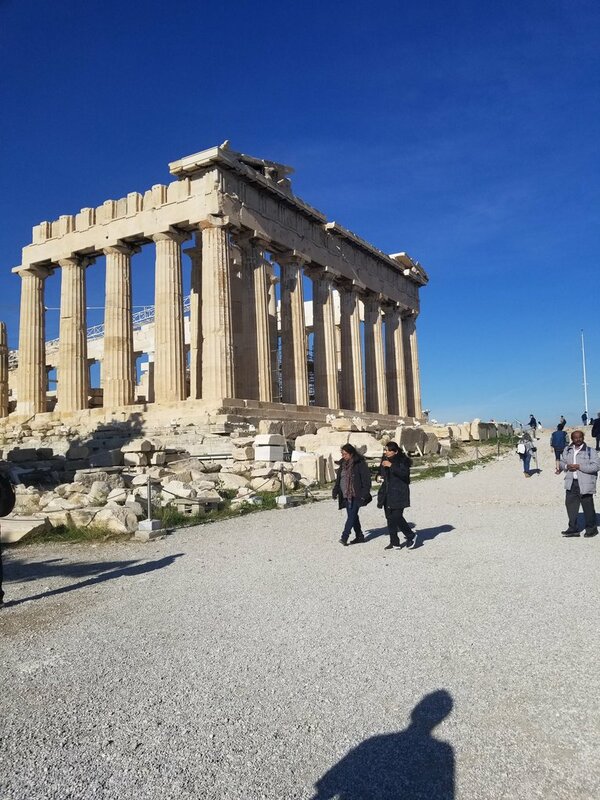 I am glad you enjoyed your trip to Greece and that I helped you have a smooth and hassle free experience (despite the small mishaps you pointed out). I would be happy to welcome you again anytime! The trip was amazing, Greece is a country that has lots of colors, flavors and adventours. Tasos was very helpful and on the Two occasions we had an issues with the hotels he made sure he got an upgrade or a change of hotel. I would advise to take a close look at the hotels before booking them. I am very glad you enjoyed your trip and I am looking forward to welcoming you in Greece again. About hotels, it is true I always provide information and links and encourage travelers to take the time to review them carefully before selecting, as at the end of the day and budget aside, it's a matter of personal taste. Tasos did a superb job setting up what is, perhaps, a somewhat unique trip. 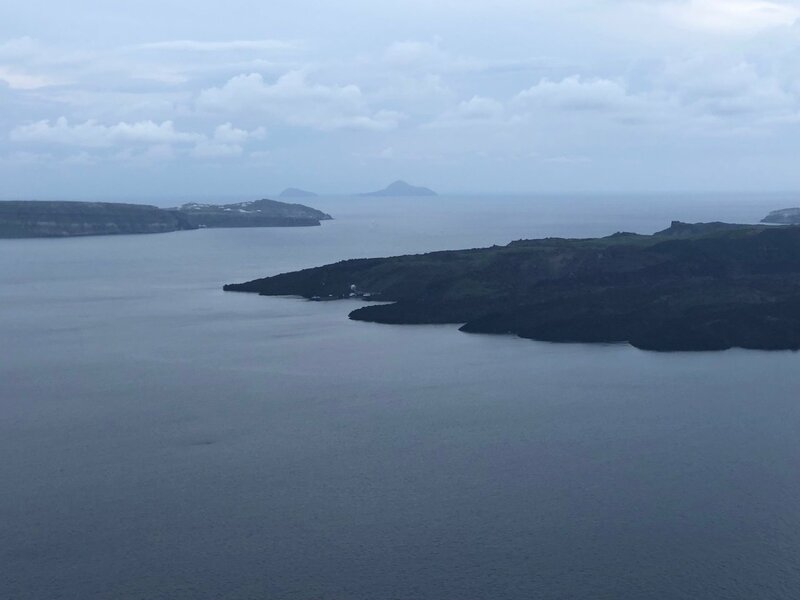 No islands but remote, ancient Byzantine churches. No beaches but many monasteries. No classical sites but every Byzantine site within reach. With other travel agents we've had to go back and forth several times to convince them we knew what we wanted. With Tasos - one time and he had it. Thank you. 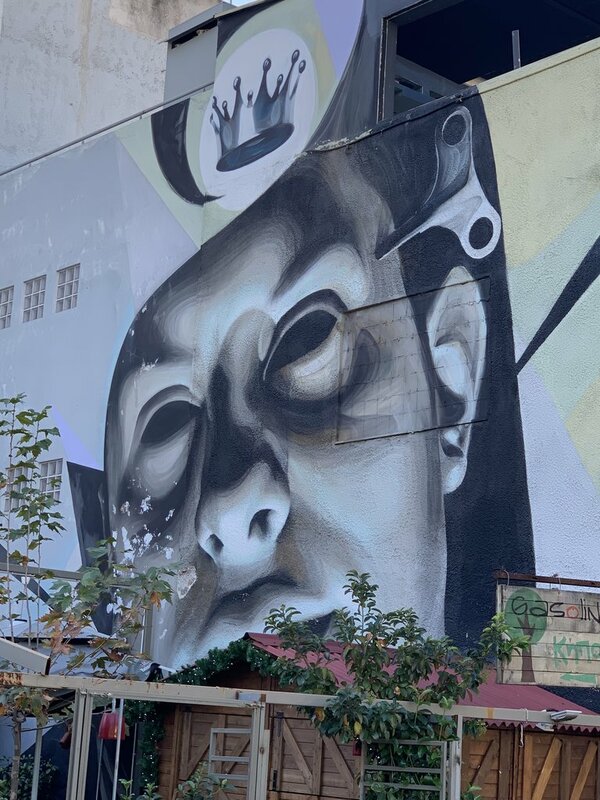 Thessaloniki: great city for walking, Byzantine sites around every corner, great climate and sitting on the bay, enjoying a great ice cream cone and watching the ships come and go can't be beat. Kastoria: fascinating old town best suited for wandering and discovering. At the Byzantine Museum we discovered Achilles, a guide who took us on a walking tour of the town. He knew the history and culture and, most important, he had the keys to the locked churches we wanted to visit. Meteora: monasteries in the sky. All I can say is that they're worth the hard work of climbing the hundreds of stairs. See as many of them as you can. Nafplio: laid back port town - this was a great place for us to kick back for a couple of days at the midpoint of our trip. Monemvasia: a medieval town built on a large rock in a bay. A map can't do it justice for walking around - you have to be aware of all three dimensions. Climbing to the upper city for sunset was a wonderful experience (the sunset, not the climb.) The town did help me appreciate how tough people had to be in the Middle Ages and why the life expectancy was in the low 30s. But today, the town is full of great places to stay and eat. Athens: 3000+ years of history and a third of the population of Greece make it a daunting city. 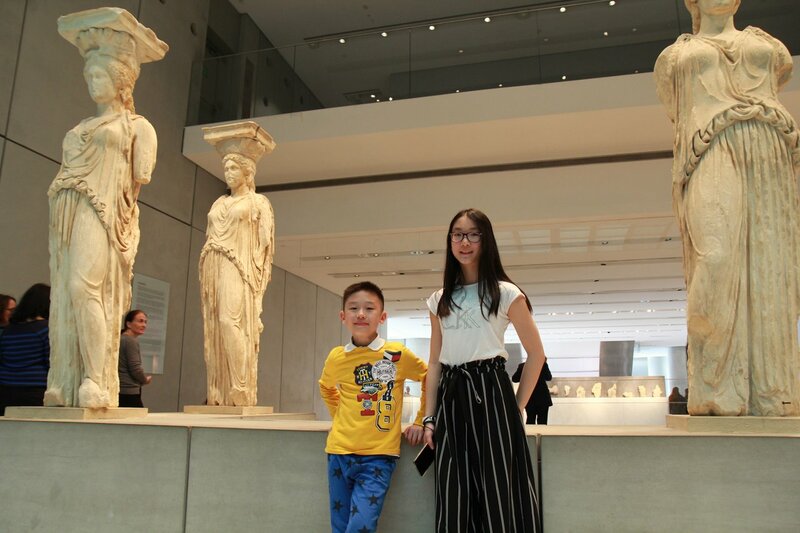 For this, our first trip to Greece, we concentrated on the museums: The National Archaeological Museum (where the Antikythera device resides and is being researched), The Acropolis Museum and the Benaki Museum stand out. All in all, I'm not sure why it took us so many years to get to Greece but I'm glad we did. It was a unique trip indeed, the sort that makes my work really exciting and challenging at the same time. Actually your trip triggered me to further research Byzantine sites in Greece and I have discovered amazing treasures. Thank you! I am very happy you enjoyed your trip and I am looking forward to hearing from you in the future. We had a fabulous trip and were able to relax and enjoy every step of the way thanks to kimkim and Tasos. I was nervous at first using a travel service that I couldn't find many reviews for, but it couldn't have been better. The planning process was easy and fun, with an email exchange with Tasos to find the right mix of active/relaxing/cultural activities. He found great hotels for us and arranged all transfers. In the midst of planning, the ferry schedule changed and Tasos alerted us right away so we could make necessary changes to our plans. Without Tasos, we wouldn't have known about that change. Lampros, our driver from the Athens airport to hotel, was very professional and knowledgeable. We were greeted with a vodaphone card and phone battery charger in a welcome packet. 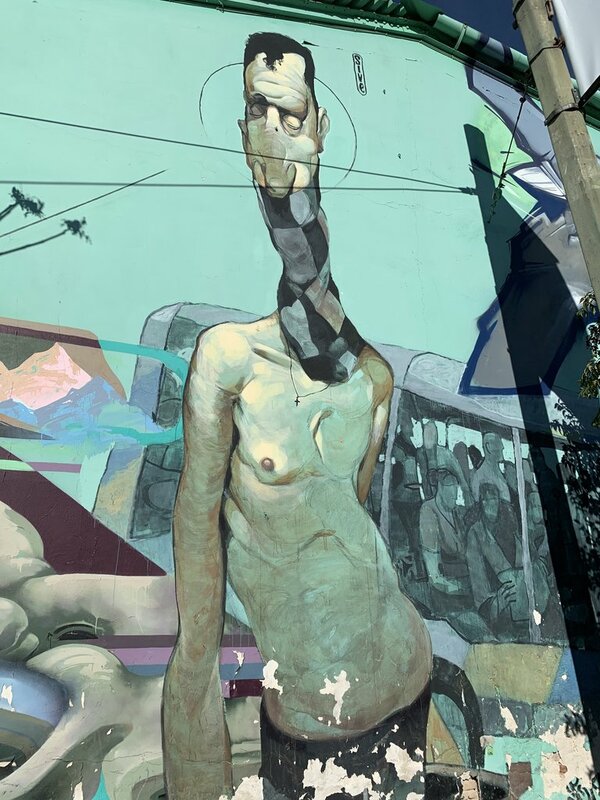 We only had one day in Athens, so Tasos arranged a combined Mythology and Food Tour. Katerina, our Mythology guide was knowledgeable and entertaining. The suite with private and hot tub at Aphrodite & Venus Hotel on Santorini was beautiful with wonderful breakfast. The Wooden Boat tour with dinner/saxophone/sunset was a fun tour with guide Christina. We also enjoyed our stay in Naxos. The Nastasia Village Hotel was quaint, also with delicious breakfast and made to order eggs each morning. The host family was welcoming and helpful. 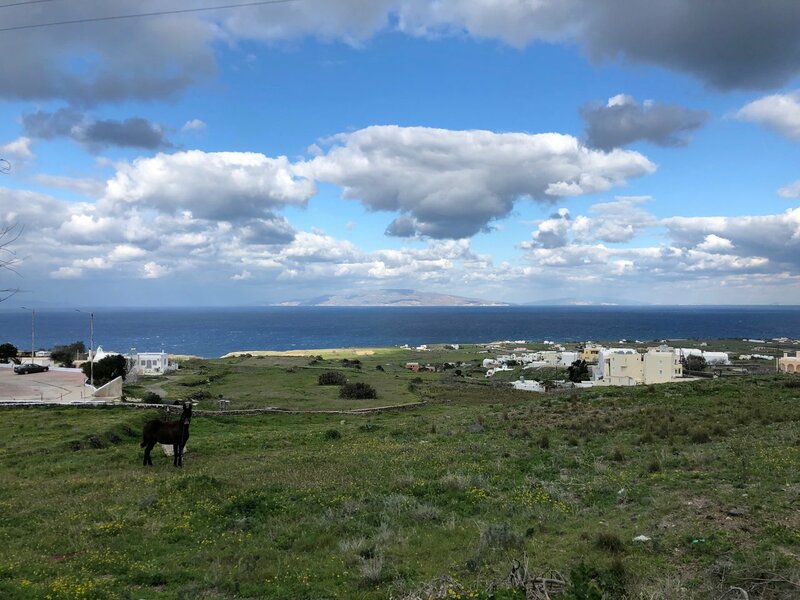 The Naxos Trekking hike we took was a highlight with a guided tour just for the two of us. 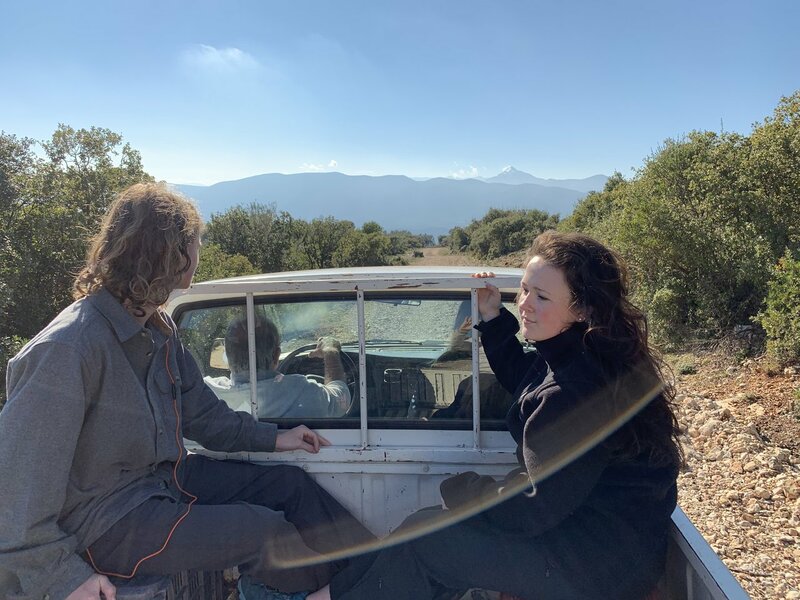 The day prior, the original tour guide was called away unexpectedly, but it was seemless to us as Taos made arrangements for a new guide, Matina. He offered a refund for that tour if we weren't satisfied, but that tour was a highlight of the trip. Tasos arranged for the taxi to pick us up from the hotel and meet Matina in Chalki where headed off for our hike. The taxi picked us up at the end of the hike to go back to the hotel. We had Tasos arrange all of our transfers to/from hotel/ferries and it made things so easy. We felt like VIPs when we showed up and just looked for a sign with our name on it. The transfer to the airport at the end was a little tight, but we made it (barely). 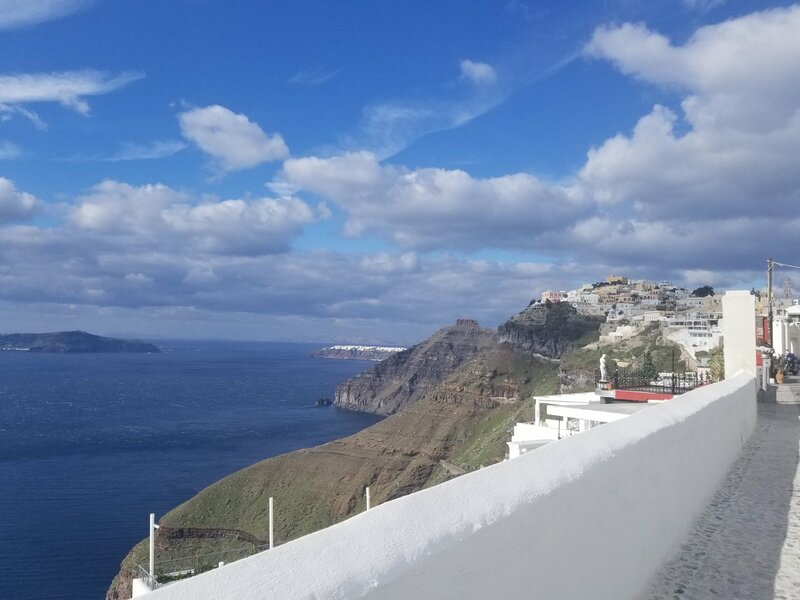 The itinerary we received from Tasos about a week before departure was thorough and well-organized. It was a great reference during our trip, but just enough that we didn't have to think too much on the trip and could enjoy the sights and the company! 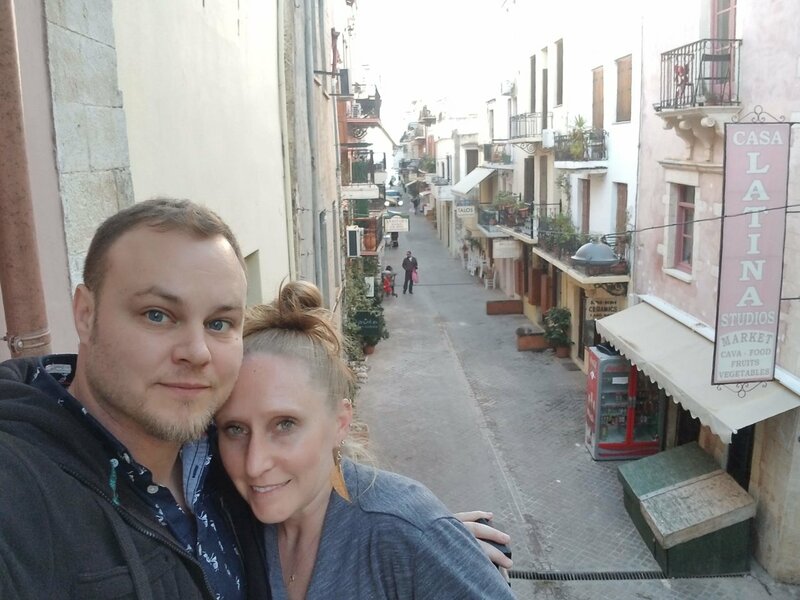 We had a couple questions during our stay and Tasos was always quick to respond via email. I would definitely use this service again. It was a great pleasure working with you and I am very happy you enjoyed your trip to Greece! 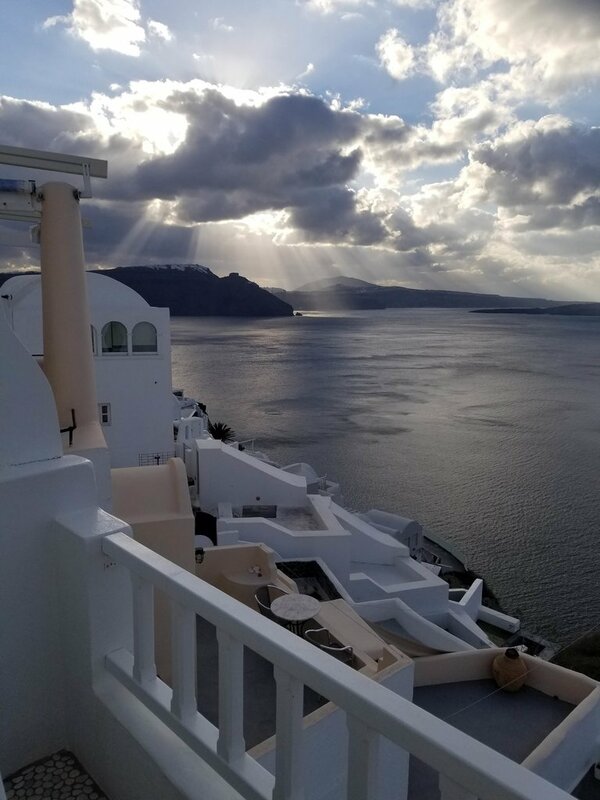 Looking forward to helping you organize your next visit so you can discover more beauty and experience more unknown aspects of the Greek lifestyle. 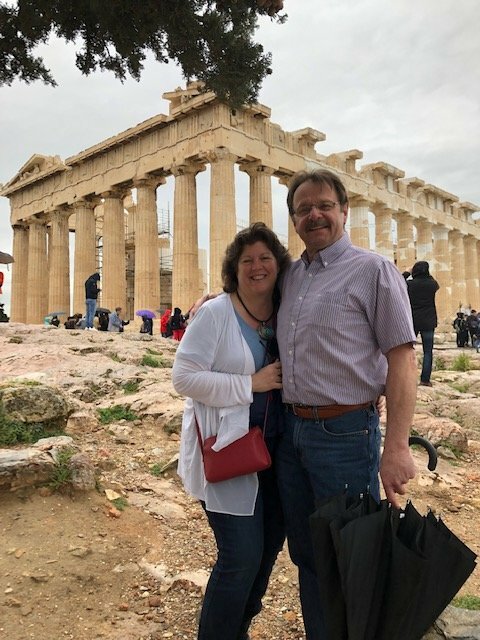 Our three days touring the Athens area was wonderful. Our guides and drivers did a fantastic job fulfilling our wishes. Elias, Dominik and Denai were professional, friendly, flexible and, above all, knowledgeable! 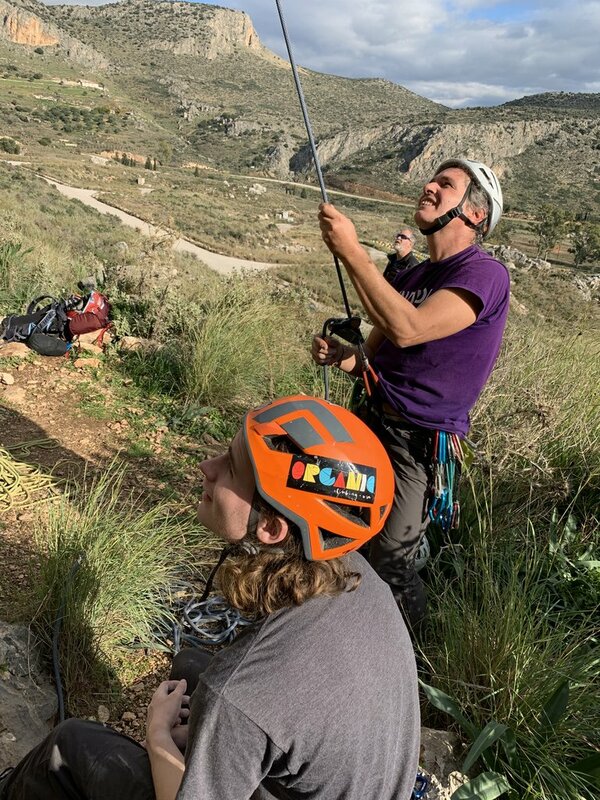 And Tasos developed a great itinerary after understanding what we wanted to accomplish during our time. Our main driver, Nick, was also excellent, safe and reliable. 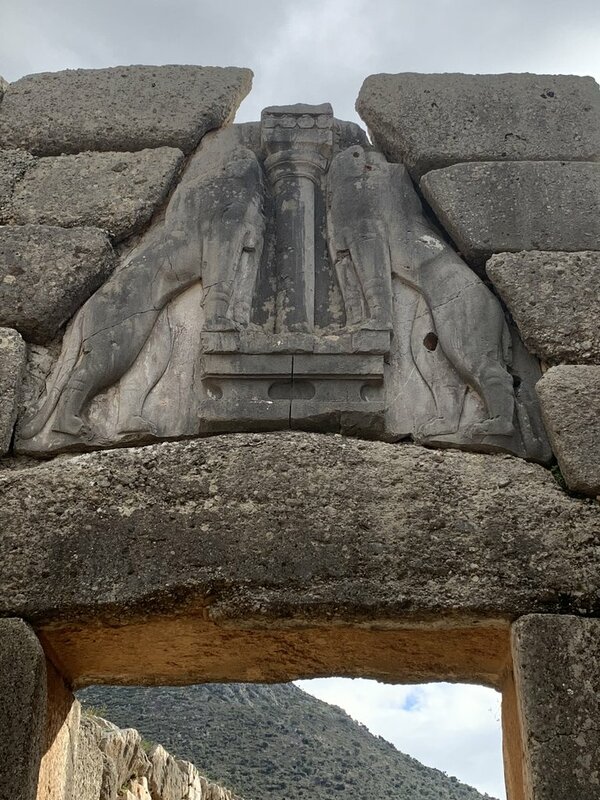 We toured three archeological sites, Mycenae, Corinth and Eleusis. 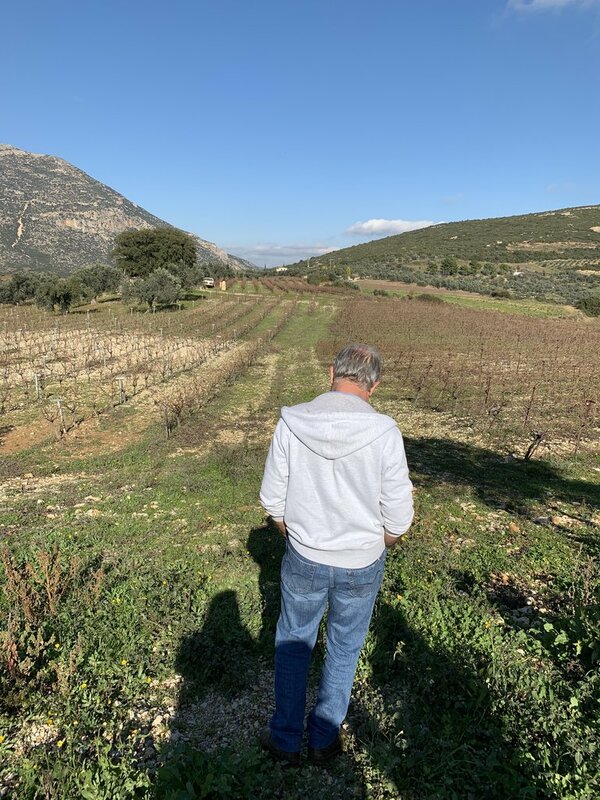 We also toured two wineries in Nemea, which were both wonderful. And we spent time in the wonderful seaside town of Nafplio. 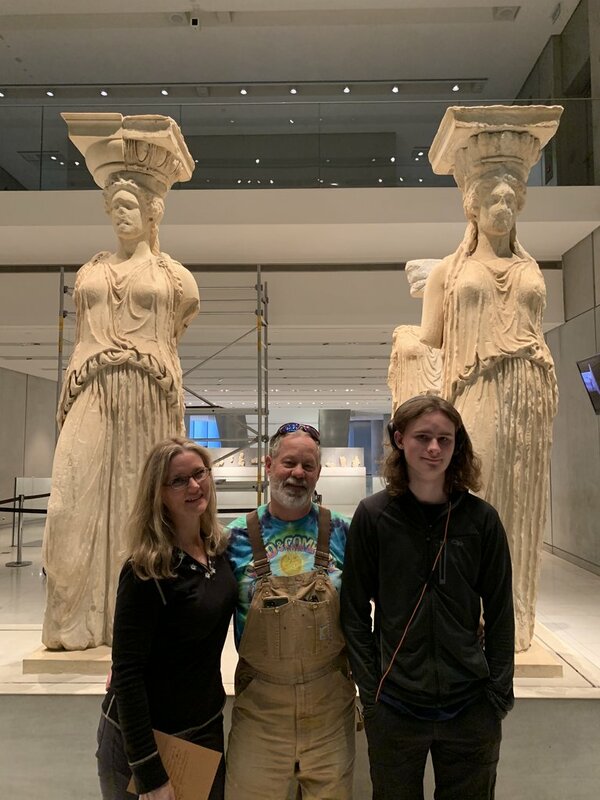 Finally, we went to Athens for one day and toured the Acropolis Museum with Denai, our wonderful guide. It was a memorable trip, which was made more enjoyable by your efforts. Thank you! We will definitely book another trip with KimKim. It has been a great pleasure working with you to plan this trip and I am very happy you enjoyed it! Wish you happy and safe travels! Tasos went out of his way to accommodate my unique request. Everything went according to plan. Panagiota was a GREAT guide to Philippi. She adjusted the amount of information provided based on our level of interest and it was fantastic!!! I am very happy this trip met your expectations! It was a unique request indeed, the kind that makes my job exciting! Hope to hear from you again at your next visit to Greece. This trip was above and beyond what I expected. Tasos completely outdid himself in creating an unforgettable tour of Greece. All of the tours I went on were informative and unique. I especially enjoyed Naxos island, from the beaches to the local food it was paradise. 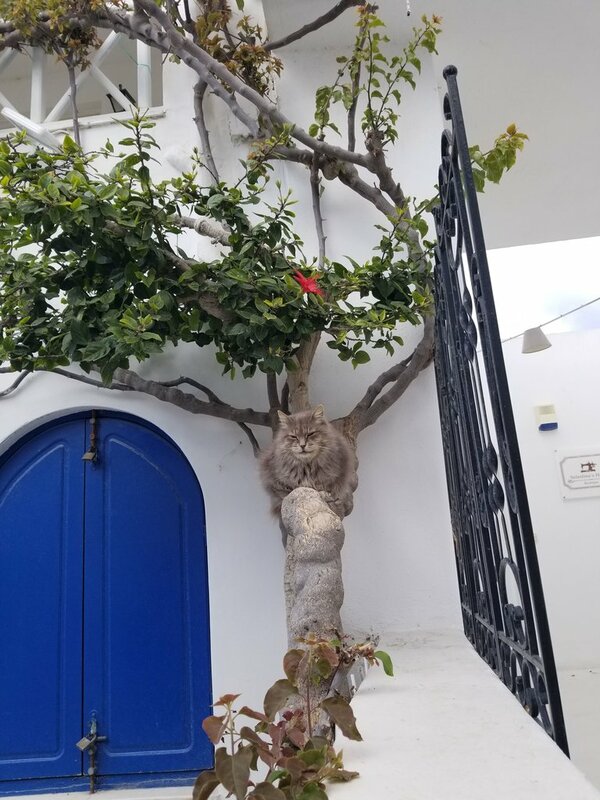 My tour guide on Naxos was also very friendly and made me feel like I was being shown around by an old friend, rather than a tour guide. Overall the trip was excellent, all of my accommodations were top notch, and my experience was nothing short of amazing. Thank you, Hunter. There 's no better reward than to to read your enthusiastic review! It was a great pleasure having you in Greece and I would be happy to organize another trip for you any time. We took the Mythological Walking tour trip. 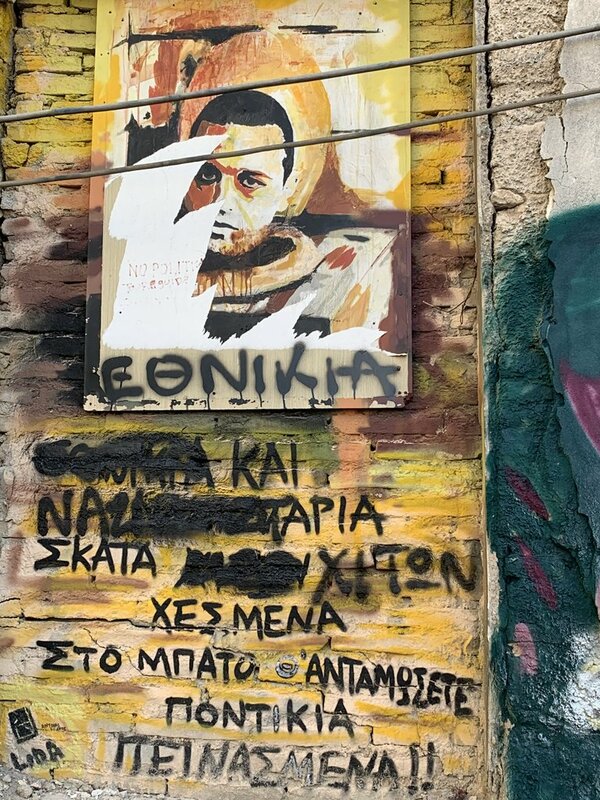 We had asked for a private tour but ended up with many other people; I guess private tour is not the same in Greece as other places. It was good trip and Iffy our tour guide was great. Thanks for your review, Michael. I am glad you enjoyed it despite the misconception of private vs. semi-private. Actually I went through our entire conversation and you never mentioned you were looking for a private tour; still, I understand I should have made the setup absolutely clear. Looking forward to seeing you back in Greece!